From the Eighth Production Yearbook, 1948. Ad may date back as far as 1919. Part 6.2: Registration: getting the colours lined up right — or not. Introduction 1—Just what are these Ben Day dots, anyway? What did Ben Day Design his Printing-Films For? Since this is Part 4 (of a series that just keeps getting longer) it’s about time I showed you some honest-to-goodness Ben Day dots. This is an illustration from a book on advertising production—(Dalgin, 1946; see footnote 1). After reading a footnote, use the back arrow in your browser or the link provided, if using iPad etc. to return to the text. Are these at last actual Ben Day dots? The real thing? Well… these are pictures of dots from a catalogue selling the products of Ben Day, Inc. Or rather, once upon a time, they were photographed from that catalogue, then printed in a book. Now, having been scanned by me and posted online, they are a bunch of pixels on your screen. Are they still Ben Day dots? 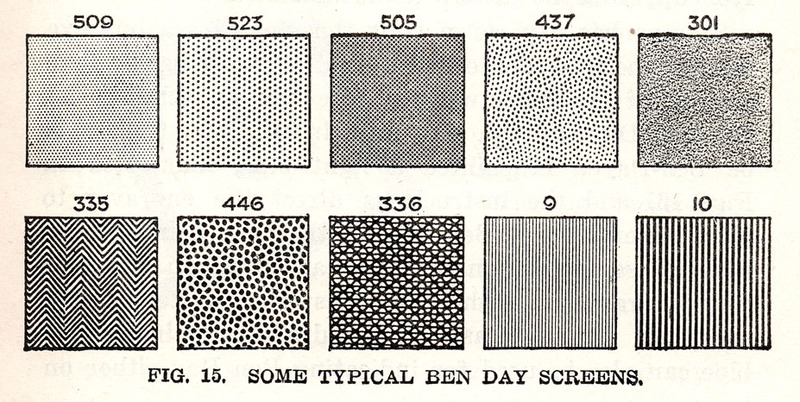 Ben Day dots originated in the 19th century. One way of defining the “real” Ben Day dot would be to look at the original process as used in the Victorian era. This could lead to an unreasonably narrow definition—or, as I hope to do, lay the groundwork for a definition of Ben Day dots which takes into account how the concept has survived into the 21st century. 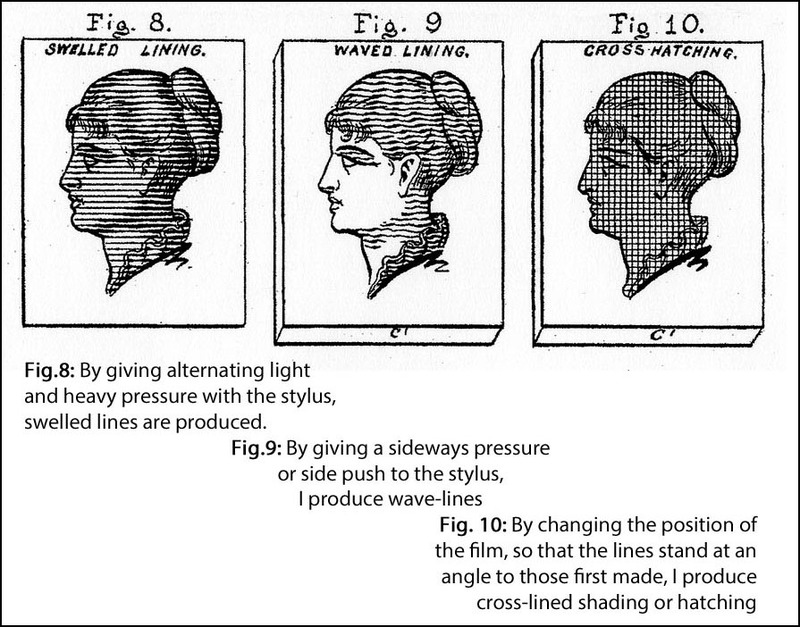 Benjamin Henry Day Junior patented his new shading method in 1879. Later in this post I will be looking at his actual patent document. 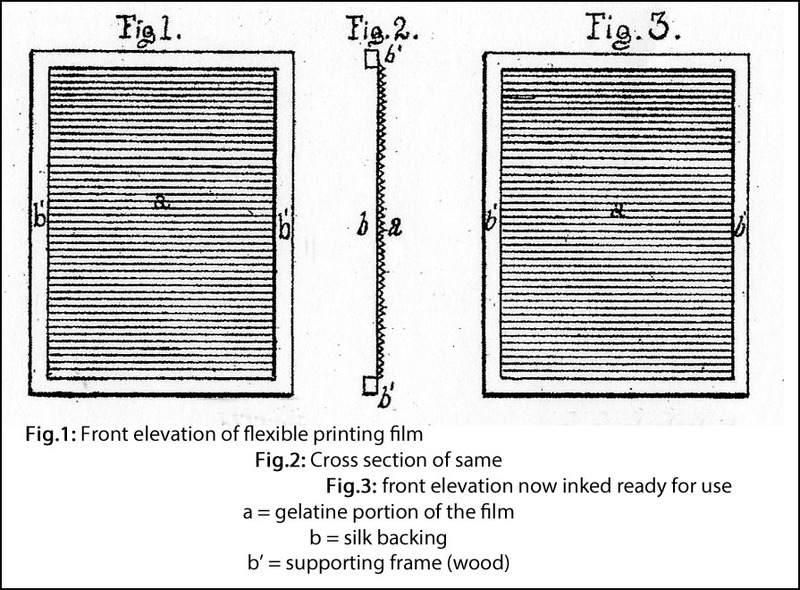 Day patented a new way of producing what would later be called “mechanical tints.” His idea was to save some of the time and effort which was being spent drawing dots and lines by hand in the printing business. His was not the first such idea, but it was the one which dominated the field for decades to come. From a 21st century perspective it is impossible to imagine just how many dots and lines were being hand-drawn (and/or engraved) in those days. Printing on paper in 1879—in particular, the printing of pictures—was done using methods which have largely vanished from today’s world. I’ll be looking at those methods in detail before moving on to look at the Ben Day process itself. Understanding how pictures were printed back then will help to explain why and how Day’s invention became a success. For about 60 years, that success was on a huge scale. By the time Dalgin (1) was writing about Ben Day dots in 1946, their glory days were over. 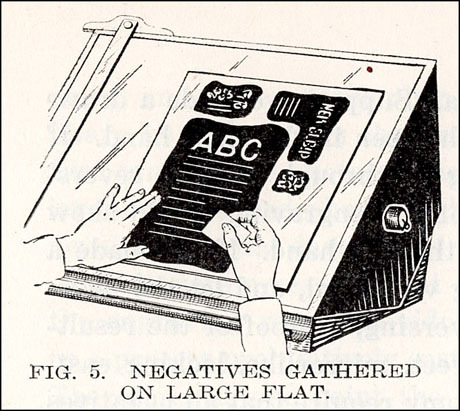 The method was still in use, but newer, faster ways of printing similar-looking tints were rapidly taking its place. This makes defining what was and what was not a “true Ben Day dot” after, say, 1940 more problematic than it might at first seem. Here’s a close-up which makes the question easier to answer… or does it? What about the painting which Roy made based on this comic book panel, M-Maybe (1965)? Any Ben Day dots on that? A lot of the dots I looked at in Part 2 and Part 3—comic book dots, half-tone dots, inkjet & process colour dots, those pixels—are trying to create the illusion of something they’re not; an area of flat colour, a continuous graduated tone, a full-colour image. And some of these other dots get mistaken for Ben Day dots. Perhaps it’s no surprise that the “real” Ben Day dot is an elusive thing. Various dots—in a comic, a newspaper, from an inkjet printer, in a magazine, on a screen—pretending not to be dots. The sub-title of my first post was “The Man Who Didn’t Paint Ben Day Dots,” a slightly mischievous but also quite serious assertion. 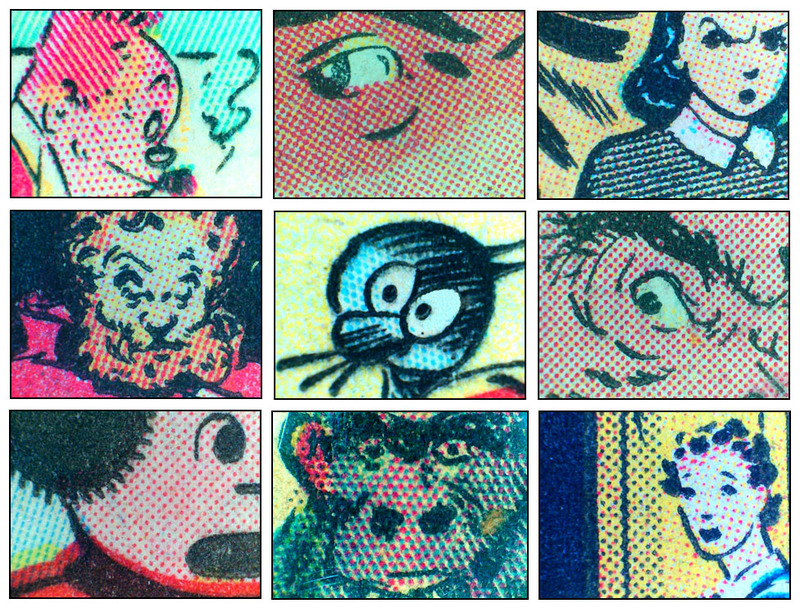 Roy Lichtenstein didn’t simply paint magnified versions of the dots he saw in the comics and small ads of the day. He painted his own personal vision of them, his response to them—Roy Lichtenstein dots. His dots were arguably doing the opposite of creating illusory tones—rather, being much larger than the originals, they set out to unmask the illusion. 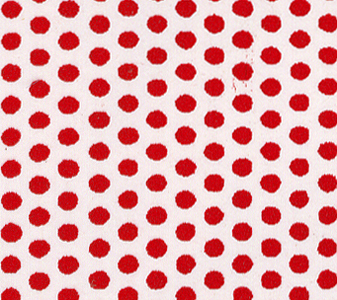 These, for example, are dots from his painting M-Maybe, as seen above. After the Lichtenstein effect set in, not only did a lot more people know about these dots—whole new levels of meaning attached to the phrase “Ben Day dots.” In fact, an online search reveals a great deal of misunderstanding about what they are, and what they are not. 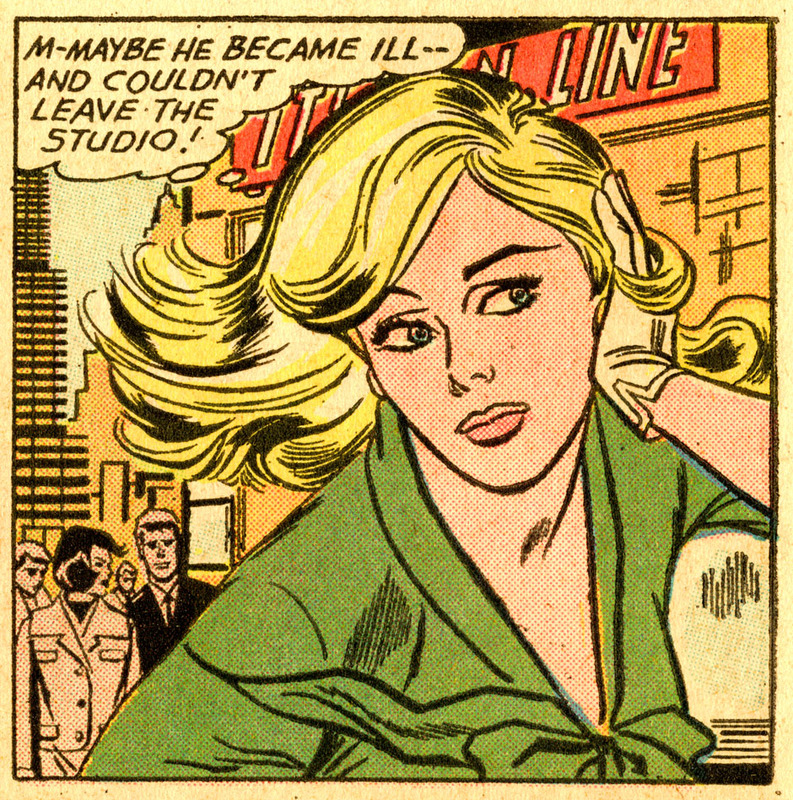 Partly this reflects confusion about the technique itself, which gets muddled up with some of its 20th century successors such as Zip-A-Tone, seen below in this 1950s panel from the IDW book Wally Wood’s E.C. Stories. Partly it is due to issues arising from the Lichtenstein effect itself. Who was Benjamin Henry Day Junior? What did he do apart from invent dots? How was his process used in the printing industry? Precisely how were Ben Day dots used in the comics? If and when the comics stopped using them, what did they use next? By “printing pictures” I don’t mean single works of art, or short-run limited editions of a few copies—though they may use the same methods I’m about to discuss. Artists making prints today (2015—and doubtless beyond) have kept many of the old techniques alive, long after their use in commercial printing ended. Here though, unless specifically noted, I’m referring to mass production—the printing used for newspapers, magazines, illustrated books and postcards, for example. I include the colour lithography used to make early advertising posters and large editions of cheaper prints for framing on the wall. Printing at that time Ben Day patented his dots was very different from what we see today. Clear accounts of this online are hard to come by. Some detailed explanations will help to clarify where Day’s invention fitted into the contemporary world of graphic art and printing. If you read through this historical material, you will start to see why Ben Day did what he did, and why his new method had 60 or more years of success. In 1879 newspapers and magazines, in general, were printed only in black & white. Special editions—e.g. Christmas numbers—or colour inserts, occasionally appeared. A Chicago paper, 1879, pages 1 & 2. Front page mainly advertisements, as was the custom. When printing text pages, in books, magazines or newspapers, ink was transferred to paper from raised areas on metal surfaces, a process known as relief printing. Two other basic types of printing are possible, as shown below—intaglio (ink below the surface level of the plate) and planographic (flat plate surface)—more on this later. Text was printed from metal “movable type,” set into frames letter by letter and locked into a “forme” before printing. Since early newspapers and magazines used only type, the name letterpress was used for this kind of printing. The name stuck around even after various radical changes had occurred—e.g. the old flat “formes” had to be copied as curved “stereotypes” to go on the new rotary steam presses which came in during the 1870s. The inclusion of pictures was another, earlier radical change to letterpress. If pictures and text were to be printed together on a page, involving only one “print run”—paper going through the same printing press only once—the illustrations had to be in relief at the exact same level as the type. Result: newspapers and periodicals in which pictures only rarely appeared—outside of humorous magazines like Le Charivari and Punch anyway—until 1842, that is. Starting in 1842, The Illustrated London News (ILN) was the first weekly illustrated newspaper. Prior to this, the press would occasionally include illustrations of some royal special occasion or a sensational murder trial. ILN Founder Herbert Ingram realised that his newsagent’s business always sold a lot more copies of these editions. The technique used for the pictures, a relief method, had been around since the 1790s, mainly used in book illustration—the wood engraving (see Section 1, below). After an uncertain start, the ILN became a real success, and many imitators followed, on both sides of the Atlantic. The combination of words and pictures was clearly something which the public was very much ready for. This was a major development in the media, comparable to the coming of cinema in the 1890s or radio in the 1920s. And these magazines didn’t just need illustrations for their stories. They contributed to the irresistible rise of another institution that we now take for granted—the advertising industry. Increasingly, advertisements used pictures to draw attention to themselves, and this was a snowball that would keep on rolling. 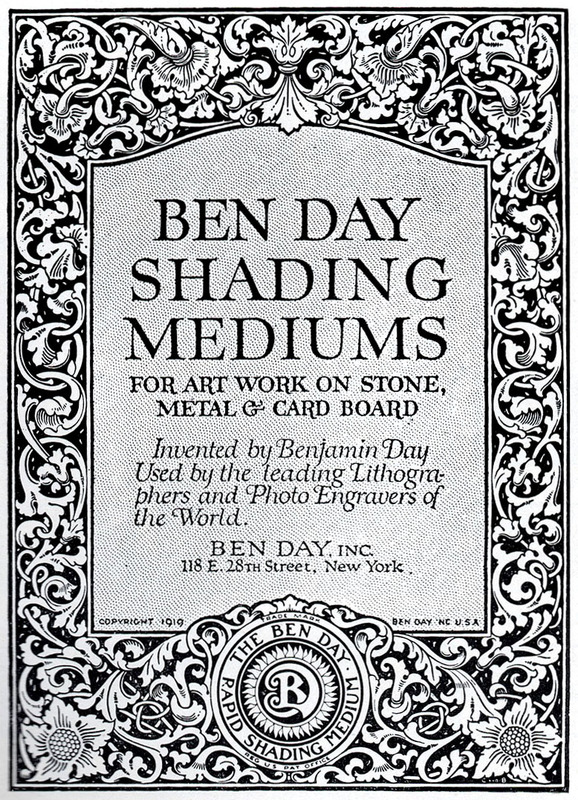 Both editorial illustrations and advertisements would later be major users of Ben Day’s method, but they had to get by without him for the first 37 years. Thus magazines and newspapers by 1879 still did not include photographs. That would require the halftone screen (see Part 2, and footnote 6) currently still in its infancy—widespread use of halftones only came in during the 1890s. Even simple black & white line drawings done on paper could not be transferred directly onto printing plates for the relief presses until another breakthrough had been made—the photo-mechanical process, or photoengraving. (Section 5, below). In 1842 this was still a long way off. It was technically possible before 1879—but it only arrived in the world of commercial mass printing during the 1880s. For true mass production during this period, a drawing, photograph or painting—even a simple line drawing on paper—had to be re-created by hand in printable form, on a printing surface made of wood, metal or stone. Wood and metal had to be engraved and the lithographic stone was drawn on. Furthermore, pre-halftone, the printed black & white image could not have any shades of grey. All such shading or “tonal effect” had to be achieved by varieties of line and dot work. Similarly, coloured images were being printed (from lithographic stone, and from wood). These also required dots (stippling) and lines to create “tints” or paler tones from any given colour of ink. These lines and dots were essentially hand-drawn/hand-engraved, though by the 1870s the human hand was starting to get some mechanical help. Wood engraving—mostly black & white (B&W) periodicals and books, colour possible for special editions. Chromolithography (colour)—special colour inserts for magazines; books, art prints, posters. Increasingly, mass production of greetings cards, cheap art prints etc. Photoengraving—in its earliest stages at this time; not yet widely used; however, a major bombshell whose fuse had been lit. 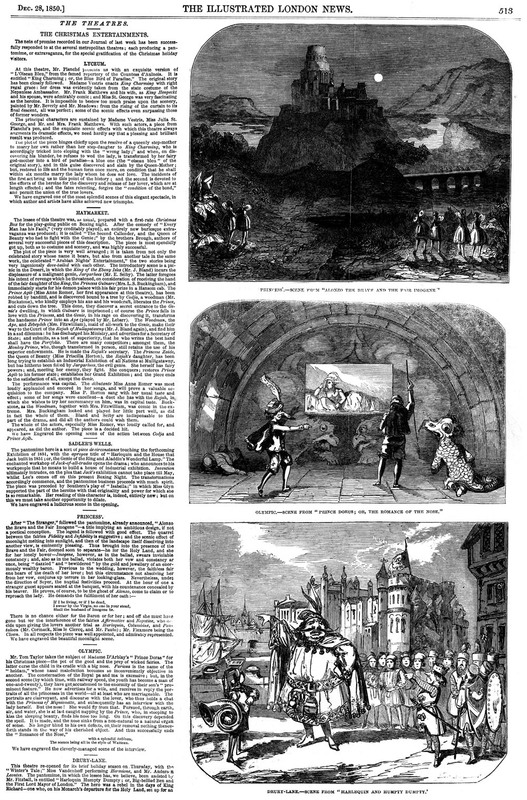 The large-scale publishing of illustrated magazines in the 1840s and 50s greatly revived wood engraving, which had been a fairly minor craft, if not quite a “dying art.” Though it was gradually edged out by newer methods, wood engraving remained the dominant form of illustration in the mass-printed press from the 1840s/50s until the early 1890s. The precursor of the wood engraving was the woodcut—printed from a carved wooden block, originating in China, developed in Japan. It came to Europe around 1400 CE/AD—just in time for the movable type printing revolution started by Johannes Gutenberg. Like letterpress, woodcut was a form of relief printing. This meant words and pictures could be locked into the same frame and printed together. Phenomenal German artist and mathematician Albrecht Dürer started as a woodcut artist, taking the technique to new heights. 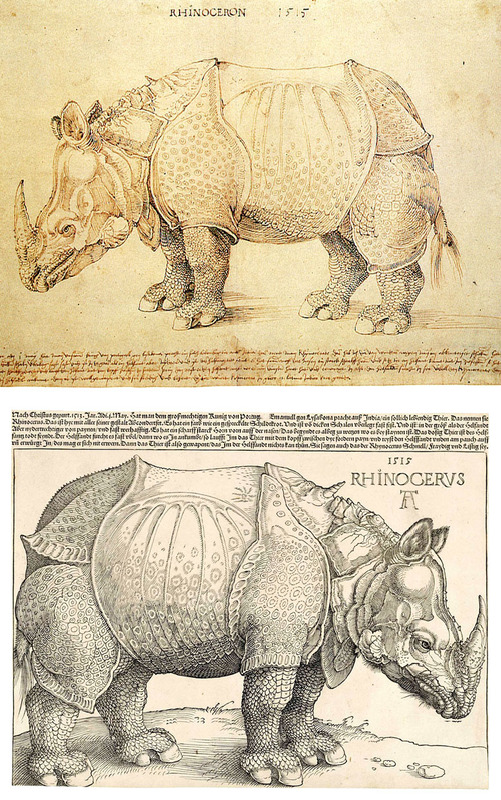 Thanks to Wikipedia I can show you both his pen & ink drawing of a rhinoceros, and the famous woodcut print made from it (1515). The drawing was not only further embellished in going from drawing to print, but also mirror-imaged or left-right reversed—of which, more later. Dürer’s two rhinos. Above, pen & ink. Below, bestselling woodcut print. To make a woodcut block, a drawing was made on a very flat wooden surface, either by drawing straight onto the wood, or tracing an existing picture from paper. The wood was then carved into by the block-maker—often not the same artist who did the drawing. Cutting the wood was a very specialised skill. Printed images were made by applying ink to the wood surface standing out in relief above the cut-away areas. Any area of wood left flat and unworked would print solid black. Where the craftsman cut away lines and shapes from the wood was where the print would come out white. 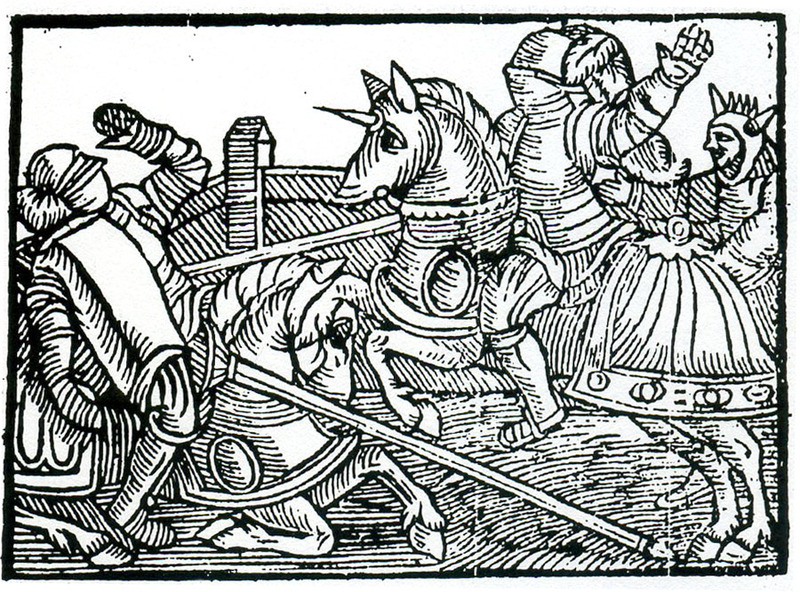 In book illustration, the woodcut peaked before the 1700s. It was superseded by higher quality techniques of engraving and etching on metal. These intaglio methods needed a very different type of printing, and separate presses from text, so illustrations of this kind took up full pages, added in to books or periodicals during the binding process. However, as illustration for cheap, popular printed material (ballads, chapbooks, almanacs etc.) the humble woodcut continued to thrive into the mid-19th century. 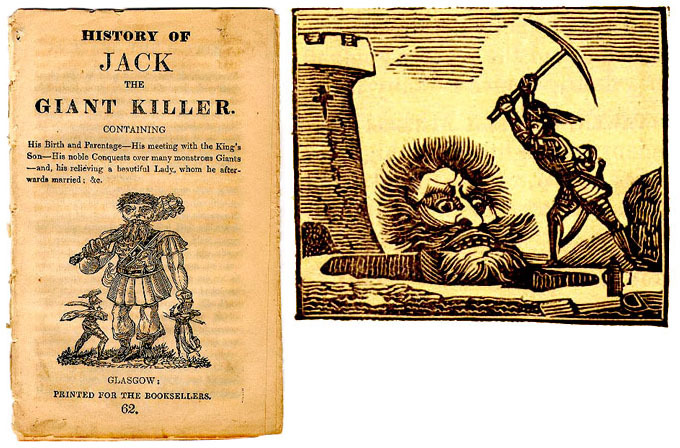 Below is early superhero Jack the Giant Killer, from around 1820. Spoiler Alert: don’t read the cover of the chapbook too closely. 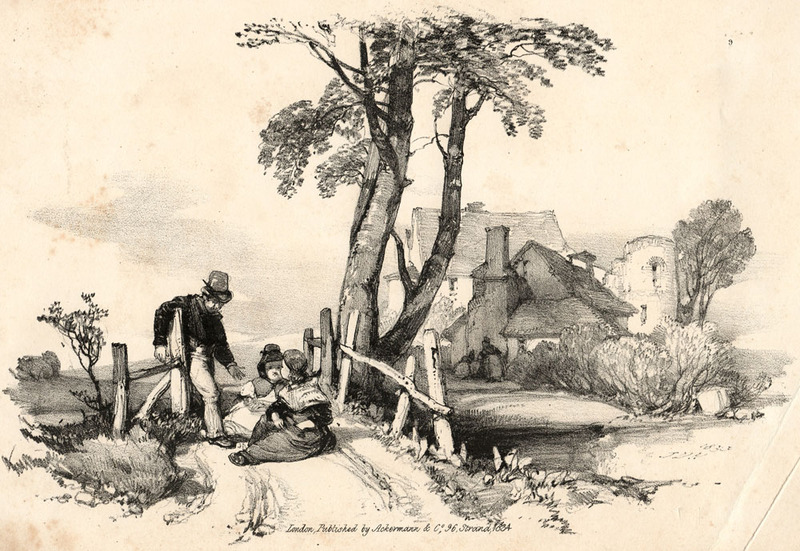 Wood engraving was the evolved descendant of the woodcut, originated by the English engraver Thomas Bewick in the 1780s-90s. His two great innovations were: working “against the grain” of the hard end of a boxwood block, rather than with the grain on the sides of the block; and use of fine tools (burins) previously used by engravers on metal. This combination allowed for finer detail. 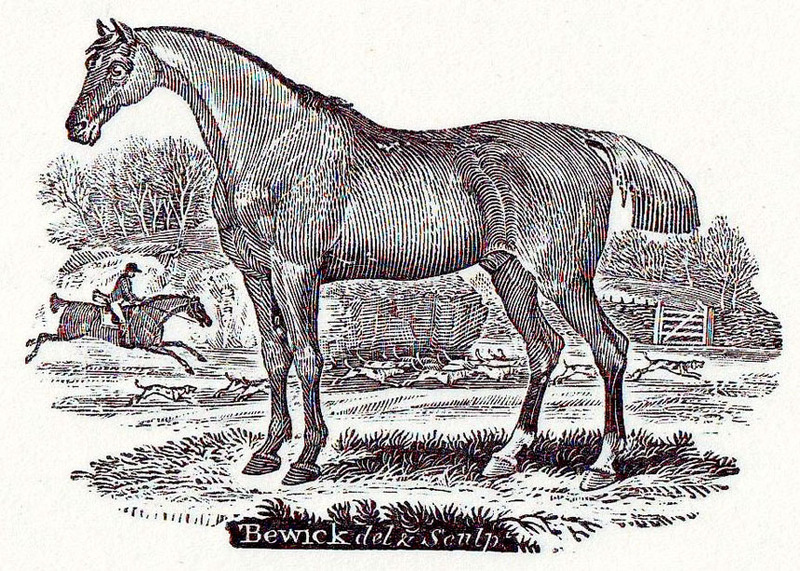 On the print shown below, “del & sculpt” means that Bewick both drew the picture and engraved it. (“Delineavit” in Latin = “drawn by,” “sculpsit” = “engraved by”.) Later on, with factory-like production of commercial woodcuts, this was rarely the case. The wood engraver achieved shading or the effect of grey tones mainly by various forms of line work. Parallel lines, often curved, and of varying thickness, were easier to make on wood than cross-hatching, which early on tended to be used sparingly if at all. (Indeed, another of Bewick’s innovations was the use of more “white lines” and the dropping of the time-consuming imitation of cross-hatched lines—though that technique came back later, as we shall see.) Dots and irregular stipples were occasionally used, generally white on black. Also, from the 1860s, increasing use was made of photographic techniques. Both pen-&-ink drawings and photographs themselves could be “fixed” photographically onto the wood blocks and copied directly by the engraver, though it altered the working surface detrimentally. In imitating line drawings, the tedious replication of cross-hatched lines now came back in fashion. This could not be done directly, as engraving created white spaces, not black lines. Instead, each white square or “diamond” shape between the drawn lines had to be individually cut away. Before long, critics including John Ruskin complained that wood engravers working for the magazines had lost any creativity they’d once had, being reduced to mere technicians—copyists, in a style called “fac simile”, “fac-simile” or eventually “facsimile.” This simply meant “making an exact copy,” and originally applied to the very precise copying of pen-and-ink drawings—right down to details like squiggles and, of course, cross-hatching. This was adapted for the close copying of photographs. Owners of engraving companies not only gained influence over what was published but branched out directly into publishing themselves. 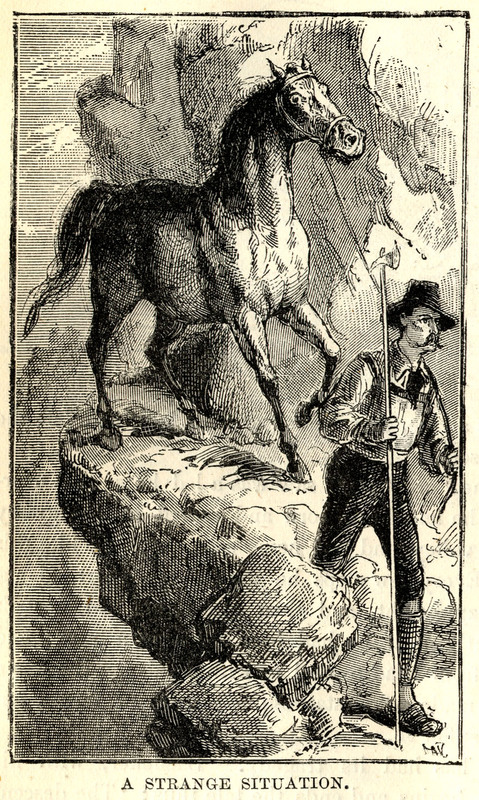 Frank Leslie, a senior engraver on The Illustrated London News, went to the U.S.A. in 1848, started Frank Leslie’s Illustrated Newspaper in 1855, and got rich. We shall be meeting him again—or at least his paper. 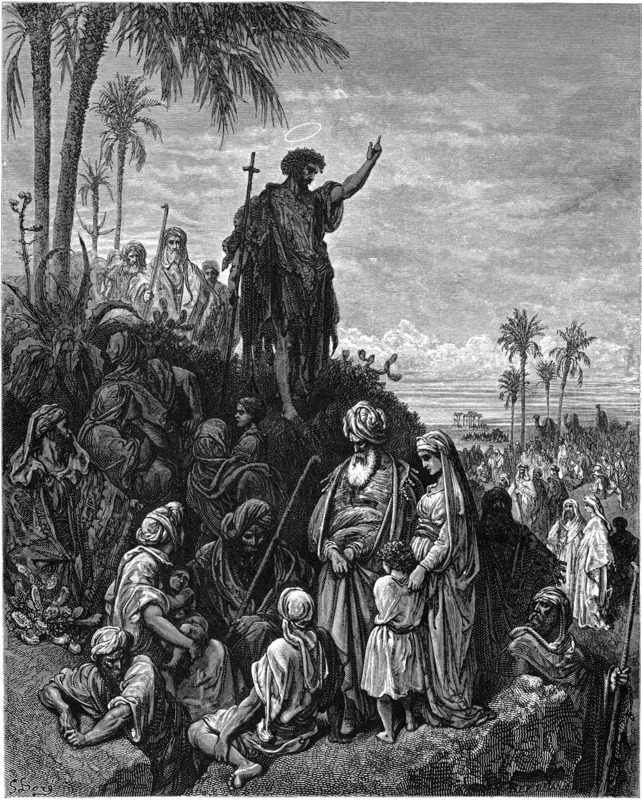 Gustave Doré and his engravers, in the 1860s and 70s, provided the Bible, Dante’s Inferno, Don Quixote and many other books with highly sophisticated wood engravings. 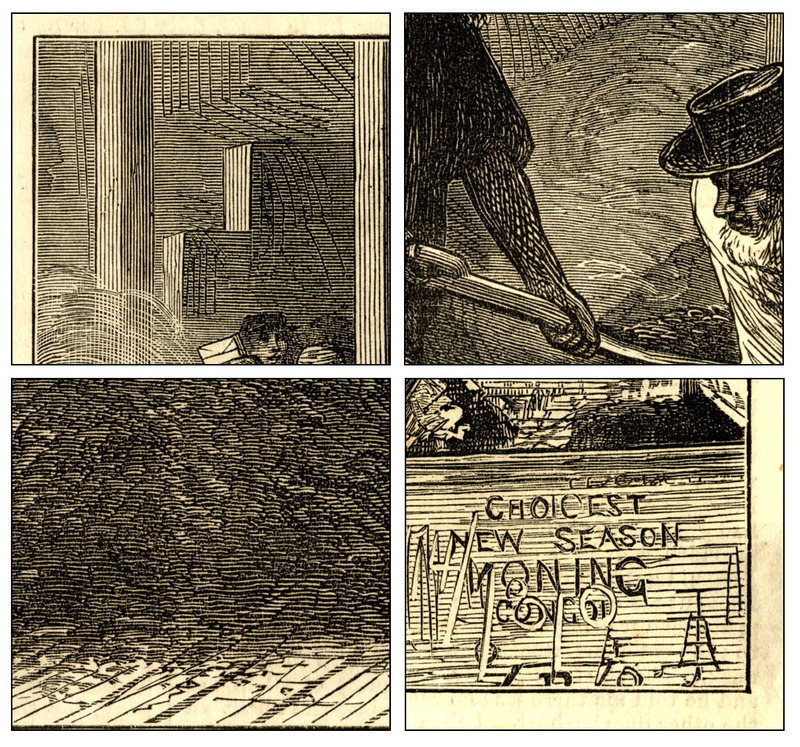 Dore’s name appears by convention in the bottom left hand corner of his illustrations, and the block-maker’s at bottom right. The increasing level of detail possible in wood engraving made mass colour printing from wood blocks more feasible. From the late 1830s, George Baxter led the way in this. His prints, and those of his many imitators, were based on black or grey images printed by an intaglio metal plate. Colours were then printed onto the key image, solely or mainly with wood-engraved blocks. Later practitioners, notably Edmund Evans, abandoned the black or grey metal key plate, working solely with wood blocks. Known as chromoxylography, this method was increasingly used in the second half of the 19th century. Some illustrated books used a sophisticated type, and many paperbacks and cheap pulp periodicals somewhat simpler versions. In the weekly magazines, similar methods were pioneered first by a short-lived paper, The Coloured News, in August to September 1855, then sporadically by the Illustrated London News, starting with its 1855 Christmas edition. But here the wood-engraved blocks were increasingly joined by metal printing plates, etched by acid, for some or all of the colour work—in some ways anticipating the later photo-engraving process. By the 1870s, the better-off periodicals were using this method, sometimes called chromotypography, for occasional special editions. The Graphic, notably, regularly had colour pages in its Christmas and Summer special editions from 1875. I shall return to these key developments in colour printing in a future post. Very often by the mid-19th century original wood engraving blocks were preserved, and the images actually printed from metal copies, originally made by stereotyping (new metal plates cast from papier mache moulds of the original formes) and increasingly by the higher quality electrotyping. 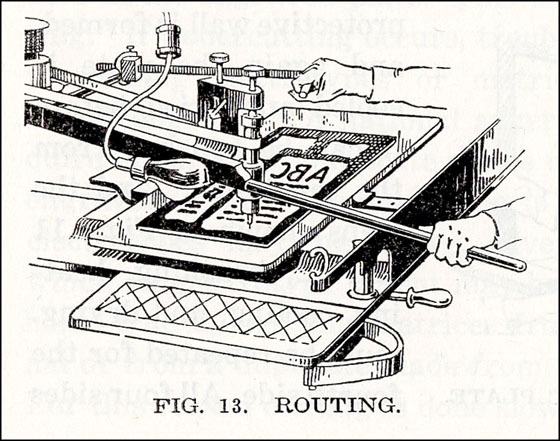 To make an electrotype, a cast of the engraved wooden surface was made in wax (or other soft material) then coated with a fine layer of graphite—an electrical conductor. A thin copper (or zinc) replica of the original was made by dipping the wax cast in a bath of metal salts and running an electric current through it—copper (or zinc) atoms being deposited on the negatively charged graphite. 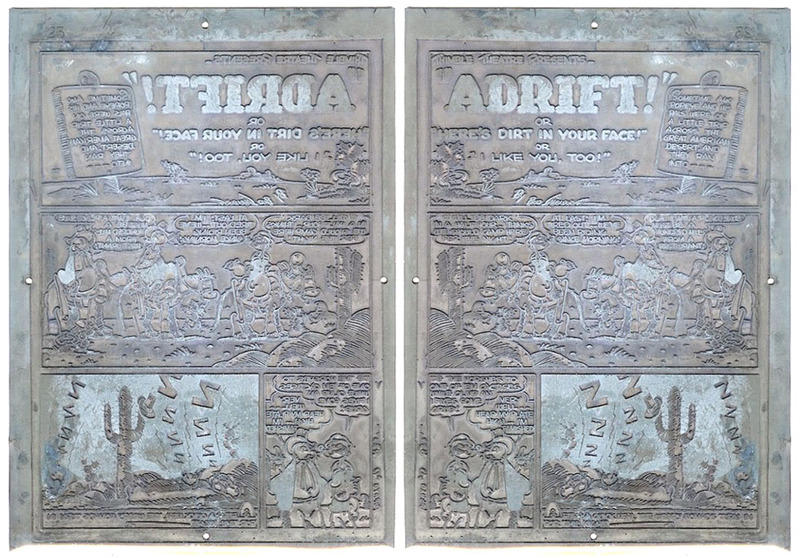 The thin metal copy was strengthened before being used as a printing plate. If you are thinking at this point, “All this engraving and electrotyping and what-not must have taken a lot of fairly skilled man-hours—and ended up pretty expensive”… hold that thought. I’ll be coming back to it. For now, let us note that engraving on wood—though it might take days to finish a picture—was at least a good deal faster than the old copper method (below). If it hadn’t been, the magazines could not have existed. 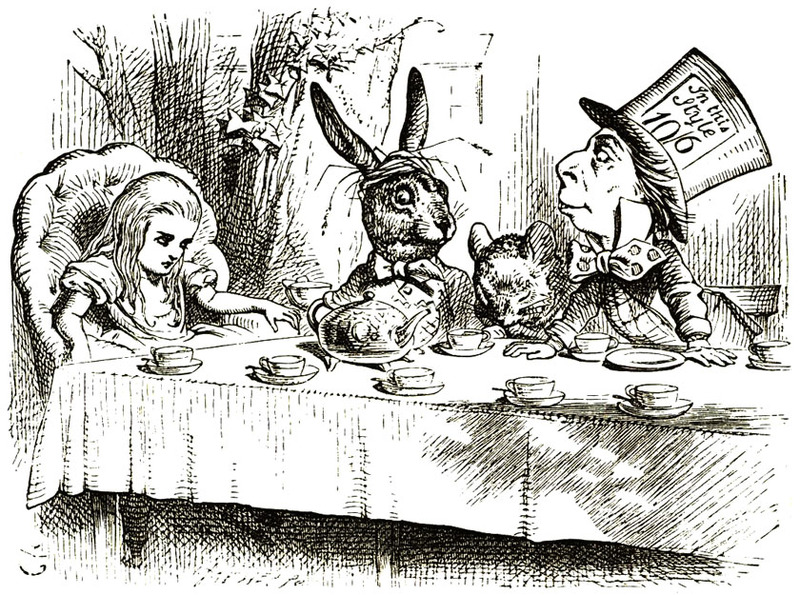 Before wood engraving took off, 19th century books were largely illustrated by engravings done on copper plates, or by the cheaper, faster lithographs. This had started in the 1430s. It involved cutting an image with hard steel tools into a copper plate, sometimes assisted by acid etching. In this it appears similar to wood engraving, but there is a crucial difference—this is an intaglio method. To make a print, ink is applied to the plate then wiped off the surface. The lines or dots cut into the copper hold ink and transfer it to paper under high pressure—i.e. the areas lower than the surface will print black, not white as in wood engraving. 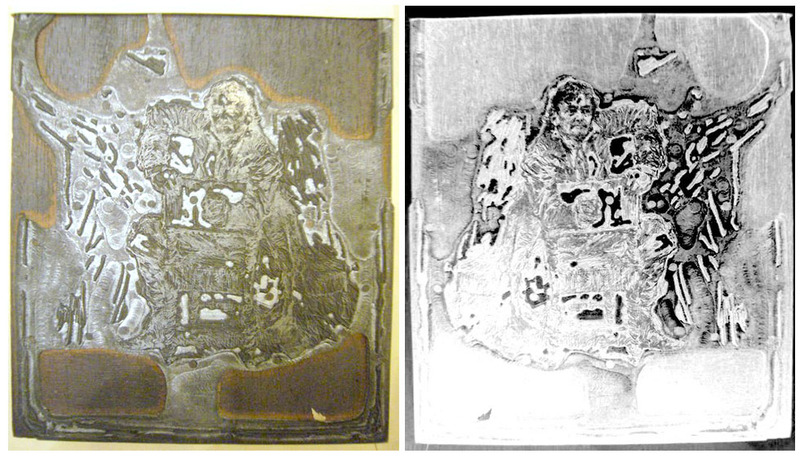 On copper, a flat unworked area prints white, the opposite of the relief method on wood, where it prints black. Copper engravings tended to be used more in high-end, small edition printing, for expensive books or prints to go on the wall. 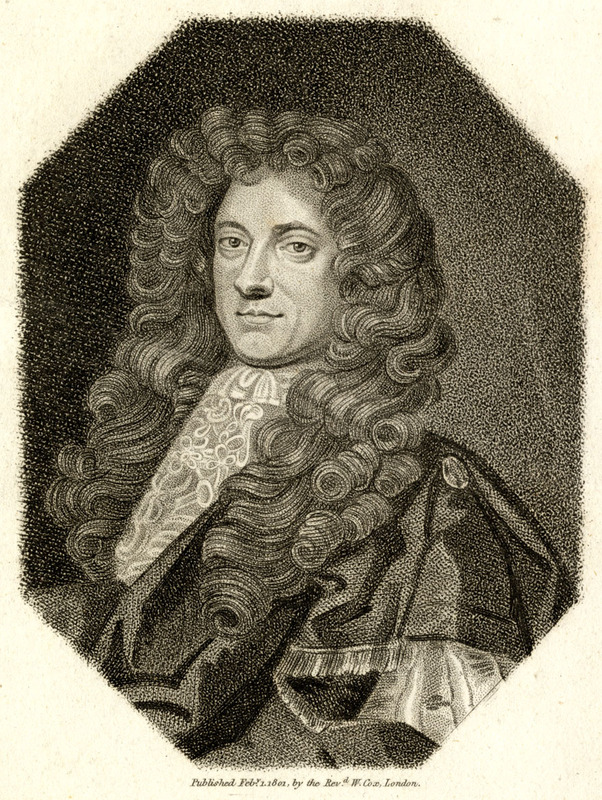 Below is Robert Walpole, father of Lord Walpole, in an engraving from 1801—a copy of a painted portrait. The print in real life is just over 9 x 12 cm. The copper plate would have been the same size. Check out that dotted shading—stippling—every dot cut or etched by hand into copper. Every line carefully cut—hours, days or weeks of painstaking craftsmanship! The pattern below is a typical stipple pattern of the kind William Blake learned to make during his apprenticeship as a copper engraver in the 1770s. 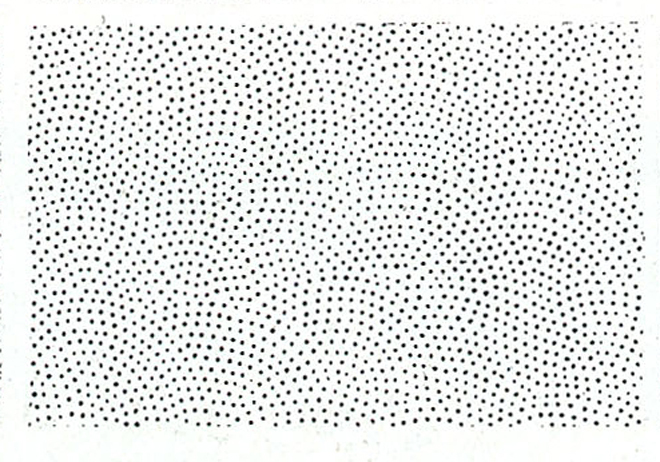 However I am cheating here—it is actually one of Ben Day’s dot patterns from over a hundred years later. 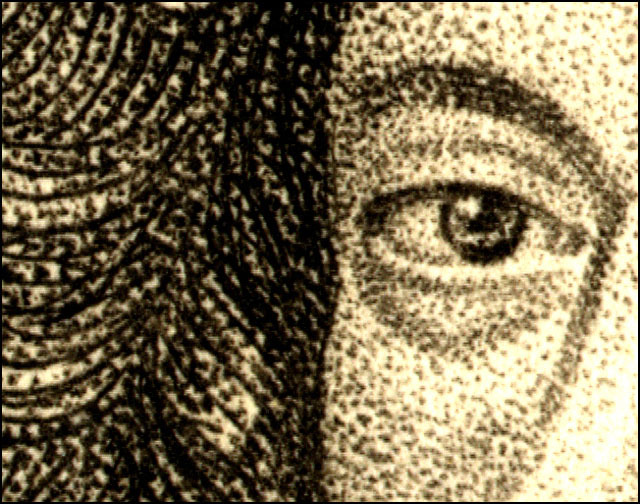 While Ben Day was at the forefront of mechanical printing methods, some of his dots were decidedly backward-looking. Stippled patterns were key to Ben Day’s early success—of which, more later. Two things are particularly notable in the 1834 lithograph which I have scanned below. Firstly, the stippling here (seen in the close-up detail) is achieved by drawing on a rough stone surface with a greasy crayon or “chalk”—a much faster process, if giving less control, than making marks on copper. Drawings could also be done on special paper, which allowed the greasy ink image to be transferred to the stone. From the 1860s, these “transfer papers” were increasingly used, the paper being made with grainy or other patterns which allowed for stippling or other variations in the lithographic image. Also, the paper drawing could be done the right way ’round, as it was to be reversed when transferred to the stone. The image areas, covered by greasy ink, were protected from this chemical change. The non-image parts, once treated, had the property of attracting water. The original ink image was then washed off with a solvent, leaving a thin greasy layer bonded to the surface of the stone where it had been. The image thus remained on the stone as a flat water-repelling version of itself. Now when the stone was wetted, the image repelled water, the non-image areas attracted it. Oil-based ink could be rolled onto the wet stone, adhering only to the image areas. The image could now be printed by repeatedly wetting and inking the stone. Every colour added to a chromolithograph needed another stone to be made—drawn by hand—and a separate print run. The stones and images had to be very accurately positioned or “registered” so that the coloured images printed precisely on top of each other. One of the darker colours would be chosen as the “key” stone, and the others all lined up against this one. This is why the letter K—for key—is used for the colour black in the later four-colour CMYK printing, as seen in Part 3. 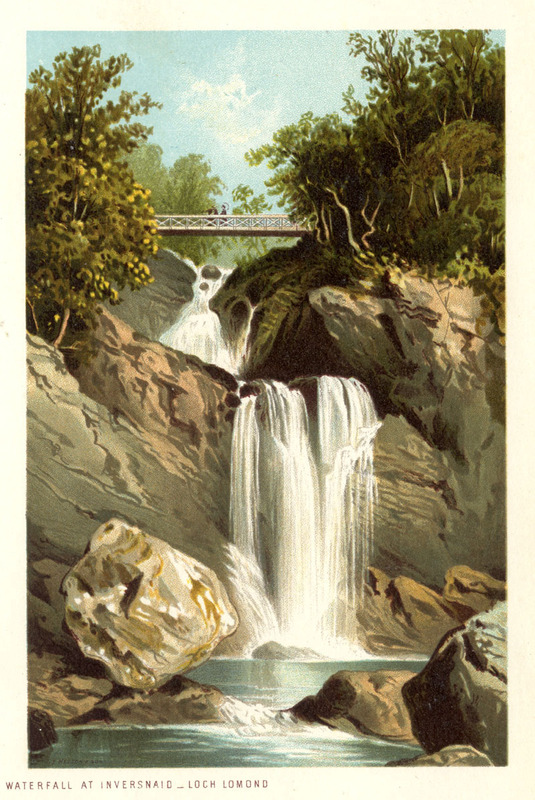 Below is an example from the entry on chromolithography in the famous German encyclopaedia, F.A. Brockhaus´ Konversations-Lexikon (1894 edition). I think the colour illustrations in this book were themselves printed lithographically. 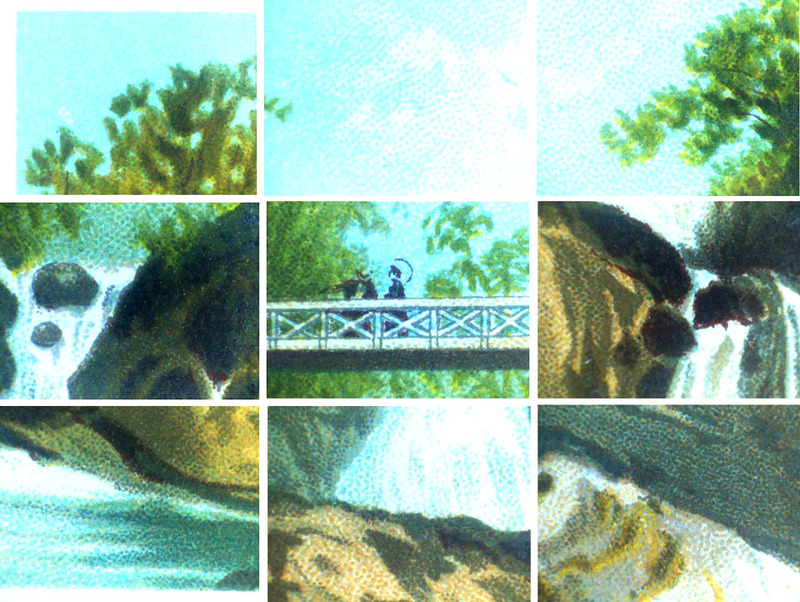 Nine colours are used here, shown in order of printing. Note how no green ink was used, despite all that vegetation. Also, no black was used in this picture, and most chromolithographs used no black ink. (If the job did call for black outlines, as later styles sometimes did, the black would be the “key”.) In order to make the block for each colour, an outline drawing (below) was copied lightly in non-greasy/non-printing red chalk—or “stained”—onto each of the nine stones, but only as a guide for the craftsmen. This is shown below. This might also be called the “key” drawing—in German, it was known as the “Konturen” drawing—i.e.”contours” or “outlines”. Below is my scan of another chromolithograph, this time a postcard of a scene in Scotland (date unknown). As noted above, each colour of ink could in the main only print as its pure self—there were no graduated or “half” tones. In fact, for the higher end of the market, ways were found to create paler washes and—by scraping ink off the stone—the effect of a “white chalk” highlight. These however were complicated and time-consuming. Overlapping of colours could be used to gain extra hues, and stippling was widely used to give the illusion of lighter tints, if on a white background, and in colour mixes. Unlike engravings, the drawing methods used on the lithographic stone did not readily lend themselves to drawing fine lines. Again, there were exceptions to this, and I will come back to the subject in part 5. The importance of photoengraving to the Ben Day story cannot be over-emphasised. This is the type of printing in which the Ben Day dot would have its biggest and most lasting success. Photoengraving is often discussed as if it were the same thing as halftone (see note 6 again). In fact photoengraving of plain B&W artwork came first, and took some time to perfect. The later addition of the halftone method greatly added to the possibilities of photoengraving, but for our purposes it is worth keeping line work and halftone work distinct. 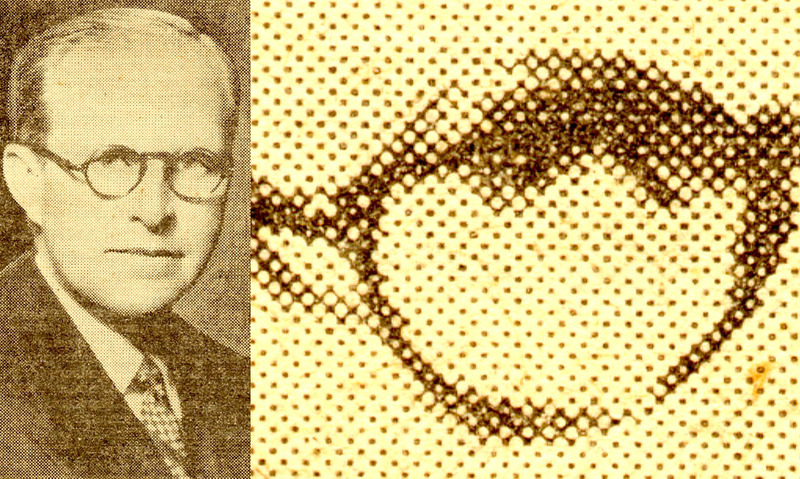 The Ben Day dot is part of line art photoengraving, though often mistaken for halftone and vice versa. A photographic image of the subject is obtained by a camera—in this example, as a negative. which gives those parts of the metal a protective layer in the exact shape of the original image. The metal is exposed to acid, eating away (etching) the unprotected (non-image) areas making the non-image areas lower than the image areas. and can be printed from. 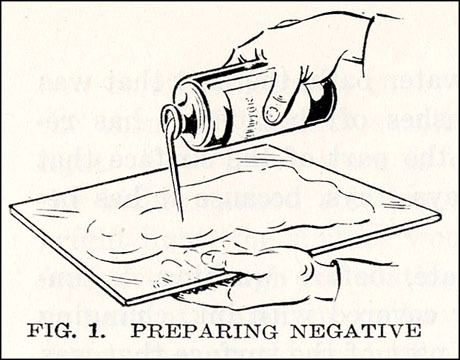 Dalgin’s Figure 1, below, shows the engraver making his own glass negative by pouring on a thick gummy liquid called collodion—a colourless, transparent solution of gun cotton in ether, which dries quickly. 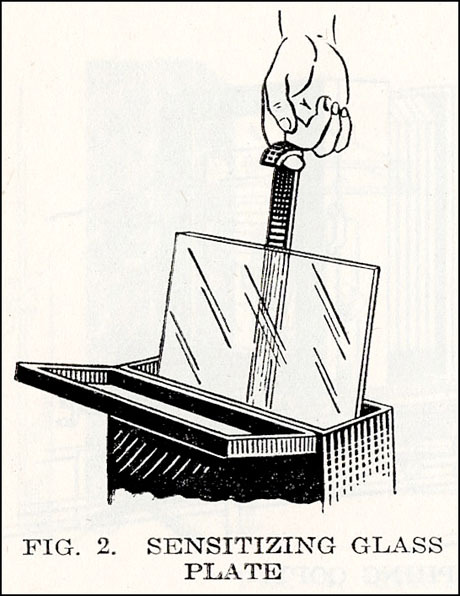 In Fig.2 the coated glass is sensitised—soaked in a solution of silver nitrate, which is absorbed by the collodion layer, effectively turning it into a large piece of photographic film. This is the “wet plate” or “wet collodion” method, invented in 1851. Before this advance, photoengraving was not feasible. The sharpness and quality of the negative image was now greatly improved, and it could be peeled off its glass backing as a thin transparent layer. At this stage the negative can be made smaller or larger than the original copy. Line art would generally be reduced for printing. The negative has to be the same size as the image on the printing plate, though—i.e the same size as the final printed image. Fig.5:—After the negative has been peeled off the glass, using a solution of India rubber in benzene, it exists as a delicate sheet of dried collodion. This is generally laid down alongside other negatives on a “flat”, another large sheet of glass. For reasons of economy, several negatives are dealt with at one time. The printing plate now has to be prepared. 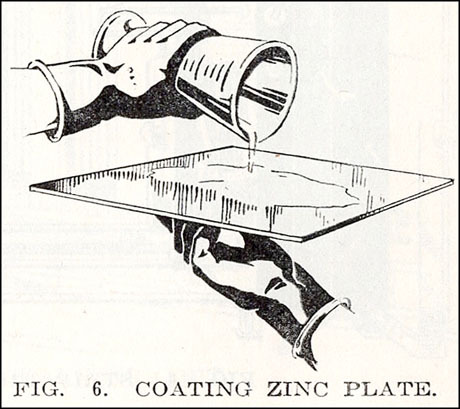 Fig.6 shows an engraver coating a zinc sheet with bichromatised albumen. In the very early days a variety of bichromate-based coatings may have been used, but by the time photoengraving was in widespread use, this had become the dominant one. In Fig.7 the flat has been laid directly onto the zinc plate and they are being exposed to very bright light. This could take an hour or two. At this stage the negatives are upside down, therefore they are left-right reversed, and so is the image being made on the plate. As we saw before, this is necessary for the final printed image to come out the right way round. In our historical albumen-coated example, Fig.8 should actually show the plate being inked so the engraver can see the images. 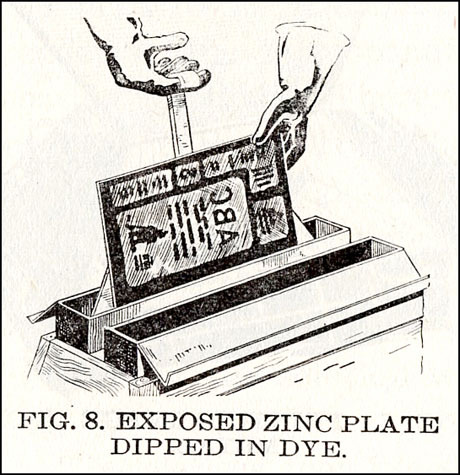 Instead Mr Dalgin shows a plate with light-hardened enamel image areas being dipped in dye—same principle, but a later development. Before this stage, there is hardly any visible difference between the light-hardened image areas and the still-soluble non-image areas of the albumen coating. 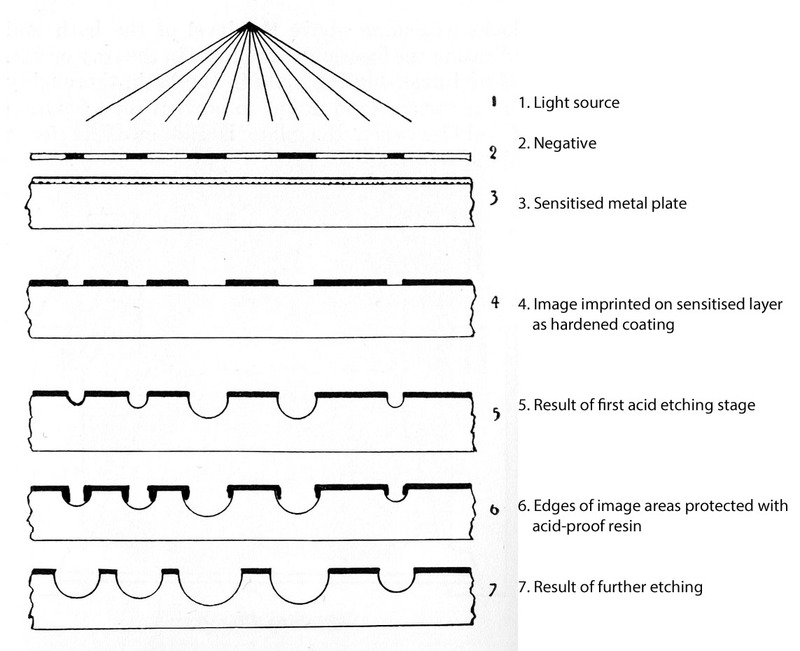 In either case, the images only show clearly after the non-image areas of the light-sensitive coating have been washed off with water (Fig.9). By analogy with a photographic print on paper, Dalgin calls this “developing” the plate. There were usually three more “bites.” Fig.11 shows the plate being powdered between bites. The powder was the legendary Dragon’s Blood, a powdered dried resin gathered from various trees and palm fruit. At every stage of etching after the first bite, it was brushed four times over the plate, so as to protect all four sides of the raised metal areas from undercutting by the acid. 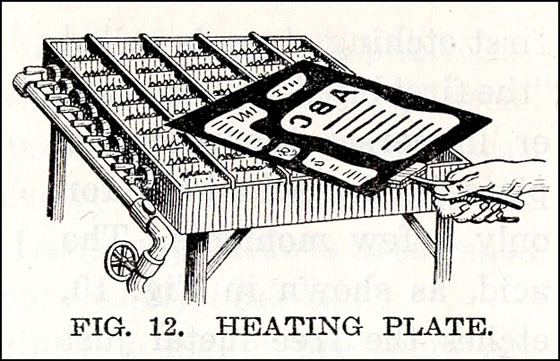 What’s more, every time the powder was brushed on, the plate had to be heated over gas jets (Fig.12) to melt the resin, and solidify it into a protective layer on the metal. Before each of the 2nd, 3rd and 4th bites a cycle of four brushings/heatings/coolings was carried out—twelve in all. This could be half day’s work in itself, for a skilled craftsperson. If not done properly, the image areas on the metal would not be fit for purpose. 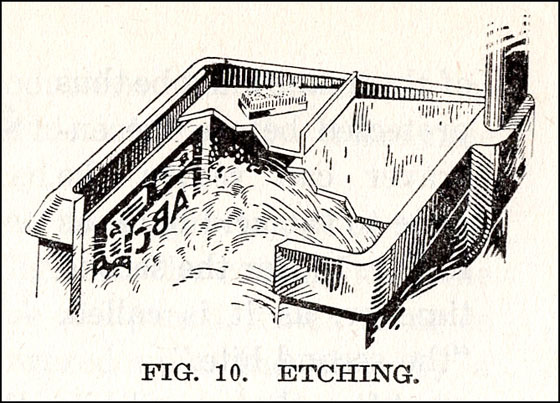 Fig.13 shows routing, in which unwanted metal is cut away, and larger etched (non-image) areas may be deepened. This was done with the aid of high-speed machines. I say “zinc plate—or part of one” because, like Dalgin’s example above, this image was probably taken from a “flat” with several negatives on it. 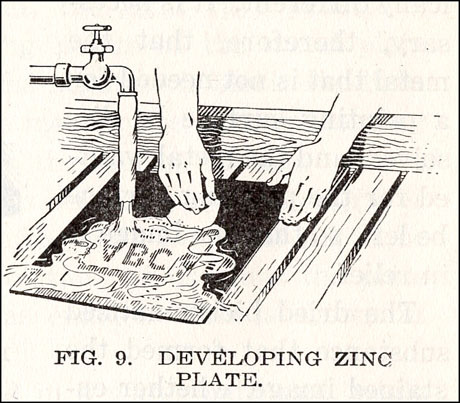 Thus the zinc plate also had several pictures on it, and was physically cut into pieces to separate them. 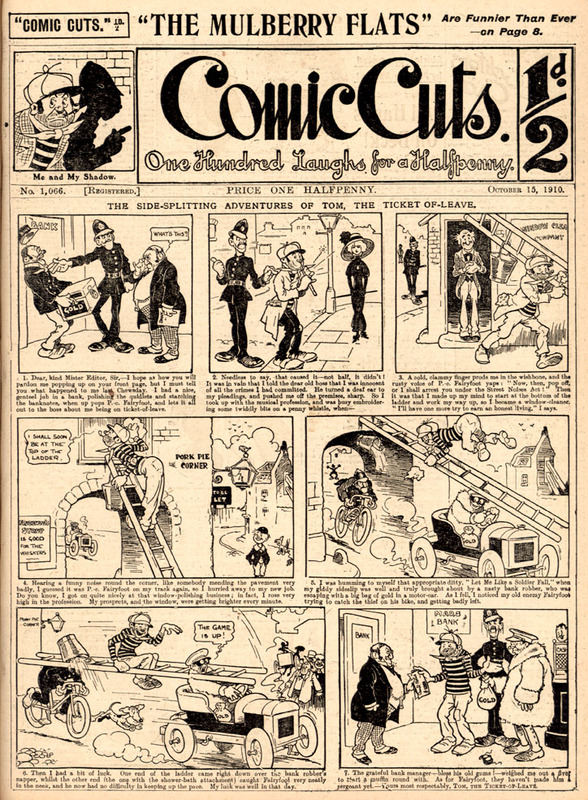 The once-common term “cuts” for individual illustrations, as in Comic Cuts (1890 to 1953) originated in the days of hand engraving, when the illustration was literally cut into the copper or wood. In the photoengraving world, the term “cuts” persisted well into the 20th century, possibly because of this cutting up of plates. In letterpress, each cut was mounted on a wood block to achieve the same level as type in the forme. Here’s something a bit more up-to-date, below—the black plate of a page from a Popeye comic book—no.13, according to its owner (22)—probably from 1950. Also flipped, on the right, looking more like the printed version. Like the original newspaper strips from which they evolved, comic books were printed by letterpress—at least for their first few decades. Final fun image, below: I don’t need to flip this one. 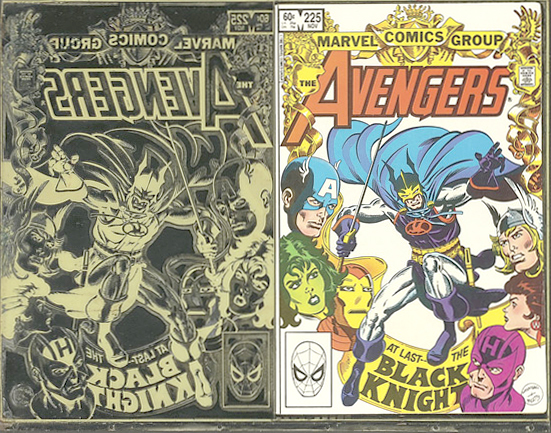 The seller of this 1982 Avengers cover plate (again the black plate) had it mounted with a copy of the comic book cover. 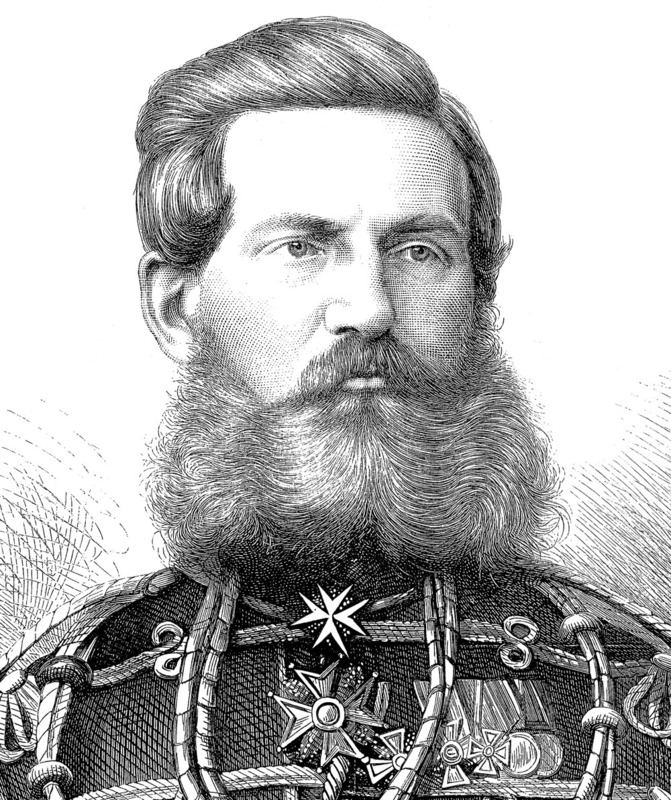 The legacy of the photoengraving revolution of the 1880s lived on for over a century. Brush or pen & ink line drawings were now reproduced without the intervening hands of the engravers. Artists no longer had anyone to blame if their drawing didn’t come out well in print. On the other hand, wood engravers had also been known to improve deficient drawings. Illustrators and cartoonists were now on their own. In the longer run this led to a Golden Age of illustration, but at first there were many anxieties to be overcome. 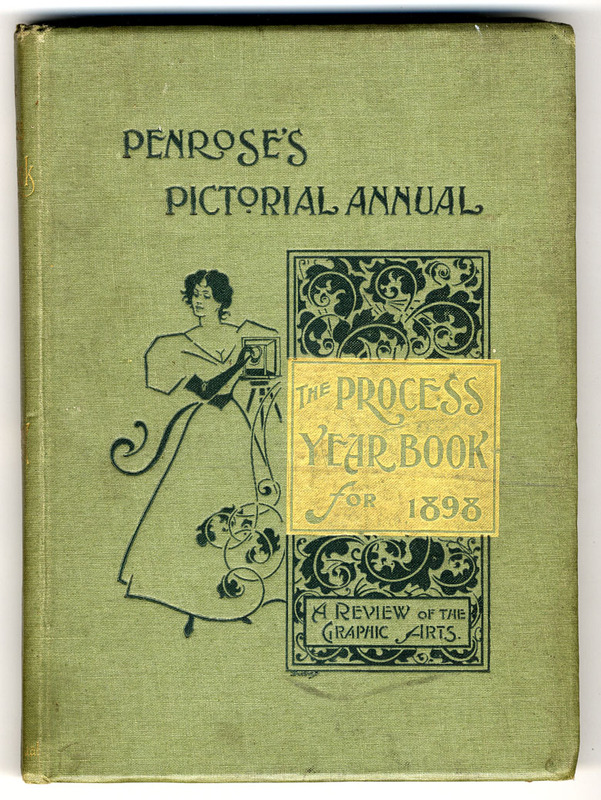 In 1894, Henry Blackburn began his book The Art of Illustration with these words: The object of this book is to explain the modern systems of Book and Newspaper Illustration, and especially the methods of drawing for what is commonly called “process,” on which so many artists are now engaged. Already by 1894 (and indeed much earlier) the photoengraving processes including line work and halftone were collectively being referred to as “process,” a name that would stick for a long time—long enough to attach to “colour process” when it arrived some time later. At this time, everything in “process” was still in black and white. One of many artists contributing new pictures to A Tramp Abroad was a decidedly average illustrator called Ben Day. I will discuss this important book in another post. But we should not meet Ben Day, unremarkable artist, just yet. It’s time to meet Ben Day, inventor of the famous dot… though I should make it clear that they are indeed one and the same person. Benjamin Henry Day Junior of West Hoboken, New Jersey, was nearly 40 in January of 1878 when he filed for a U.S. patent for his new shading medium. It was granted in April 1879. (26) It can be safely assumed that he was working on the new invention at least as early as 1877. Though Day’s artwork had been published in major magazines like Frank Leslie’s and (according to Wikipedia) Harper’s Weekly and Vanity Fair, he probably knew he was not in the top rank of American illustrators. Luckily for him—and the printing world—he also had the inventing bug. His first patent, as far as I can ascertain, was granted in 1864. U.S. Patent no. 42,530 was for “Improvement in Relief-Printing Plates.” This followed on from an 1860 patent (not Day’s) in which a chalk or hard clay surface was used to print from. Day’s improved method probably led nowhere much. Chalk- and clay-based printing never seriously challenged lithography. Author Mark Twain (him again) invested heavily in a method called Kaolotype, but famously lost his money. Ben Day’s next invention may not have troubled the bestseller lists either, though it could have been ahead of its time. 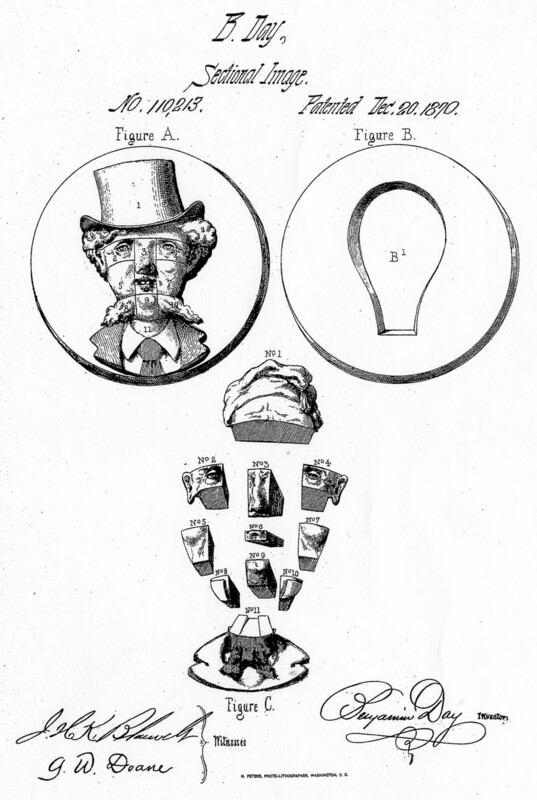 “Improvement in Sectional Images” (patent granted December 1870) was described by him as “a new and grotesque… scientific and artistic toy…” He proposed making a series of fragmented heads with different features, which could be mixed up when fitted together, to produce “from a very few complete sets of features, a vast number of different images” for amusement or artistic study. A bit like Mr Potato-Head or those flip-cards where you fold a ballerina’s top half into place above the legs of the Incredible Hulk. 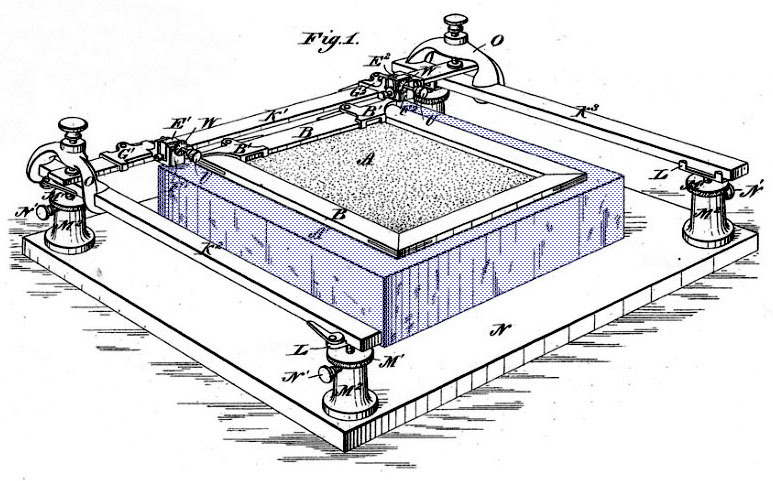 His next patent was dated April 22nd 1879, and modestly entitled Improvement in Printing Films. With this document we see the arrival of the Ben Day shading method. So this is when Ben Day patented his famous dots… ? Well… almost. This patent, in its two-and-a-half pages of text and two pages of diagrams, doesn’t actually mention the word “dot” once. It was all about the line at this point—or nearly all. Over half-way through the text, Day does eventually mention the possibility of “stipple,” and we know of course that stippling means drawing dots. But the word stipple(s) / stippling appears only four times to line(s) / lining’s thirty, and the illustrations all show lines being used. As far as I have been able to ascertain, it was 1900 before Day patented a dot pattern as such—though he was manufacturing stipple patterns as early as 1881. More on that in a later post. This foil “matrix” is heated on a flat glass or metal surface to between 100 and 200 degrees Fahrenheit (27). He pours on a warm solution of fine glue or gelatine and glycerine, and continues to heat it until most of the water has evaporated and the mixture sets solid. He backs it with fine white silk which is cemented on by pressure, then peels the film off the matrix. It is then sewn onto a wooden frame. Day notes that his film is nearly transparent; has a surface with raised lines corresponding to the engraved lines of the original block, except flexible, yielding and elastic; and has a surface which readily takes printing inks or other colours from rollers or pads. He likes silk for the backing, but says that “collodion or [any] other transparent flexible substance” would do. The commercially available version, later on, is known to have used a celluloid backing. 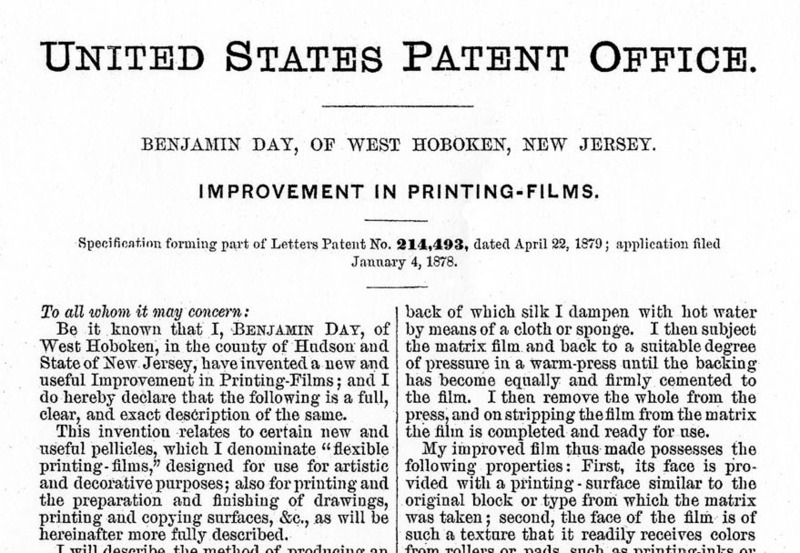 You will have noticed that all his patents so far have been for “improvements.” Why does Day call this patent “Improvement in Printing-Films”? He explains: “I am aware of the processes described in English patents Nos. 2,844 of 1867 and 109 and 2,538 of 1871; but these do not show a thin, tough, and transparent printing-film like mine, nor the process of producing the impression by the abrasive action of a stylus upon the back of the film.” These English patents are not as easy to find as the relevant U.S. ones, so for now that is all I can tell you. Now he describes transferring lines in ink onto a picture (Figs. 4 to 7, below). It is, he tells us, a picture “drawn in the usual way by hand upon stone or other suitable material.” This might indicate that Day saw lithographers as the main users of his method—more on this later. 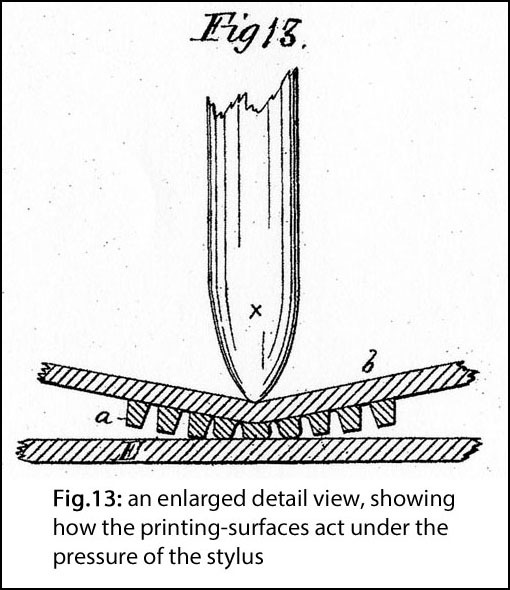 Figure 13 shows how the stylus is used to press the inked film down onto the stone or paper. We are used to thinking of Ben Day patterns—the famous dots at least—as the epitome of mechanical shading, with complete, we might say mathematical, regularity. Certainly this was one of the features which Roy Lichtenstein was to exploit in the 1960s (and Roy did use lines as well as dots himself). Day was clearly aware of this as an advantage, but as seen below he was also keen to stress that his printed lines could be imbued with variety and character by the hand of the artist or craftsperson. 3. What did Ben Day Design his Printing-Films For ? Some U.S. patents state if they are for a new design or a new method. Ben Day’s Patent no. 214,493 covers both. It is much more clear on the design (and manufacture) of the printing-films and the method of (im)printing lines with one than it is on what the method might be used for. I suspect that the imprecise language used in this patent would today be rewritten by a practiced attorney, so as to define far more specifically the purposes to which the method was foreseen to be put. Here when he says “printing” as in “printing and the preparation and finishing of drawings” does he mean (im)printing his patterns onto drawings, i.e. directly from his printing-film, or does he mean he mean “for commercial printing of drawings by lithography etc.”? Admittedly, printing plates/blocks are “other objects,” but to me this conjures up a vision of a carved ivory walrus, decorated with a regular grid of fine lines, in a room with the prettiest window panes in town. This is a very revealing paragraph. Firstly, it is the only clear indication in the whole document that Day foresees his films being used during the photoengraving process. By “etched blocks” and “printing blocks” he could mean metal plates, which were widely referred to as blocks in the early days. Secondly, despite that “Another …” which again seems to relegate this to a secondary usage, it demonstrates that Day saw the lithographer as a significant user of his films. I find it interesting that he doesn’t directly mention photoengraving on metal plates at all in this 1881 patent, and only very briefly in the 1879 one. Day is particularly proud of his cross-hatching. As he says: “To execute good cross hatching, either in drawing or engraving by hand… is one of the most difficult, laborious and expensive operations known to the artist.” I noted earlier that cross-hatching was a particularly difficult thing to achieve on wood, involving cutting out the white spaces between the black lines. Day must have known that imprinting his lines on their blocks would not have helped wood engravers very much, if at all. They would still have had to carve away the wood around the lines, and they already had mechanical devices to help them engrave fine parallel lines. Given that wood engravers are very unlikely to use his printing-films, it’s strange that Day should mention wood engraving at all, let alone give it apparent emphasis… but I will return to this below. With the benefit of hindsight, we know that the first big success of the Ben Day method was in the field of chromolithography. Here the speed and efficiency of his method was indeed a crucial factor. 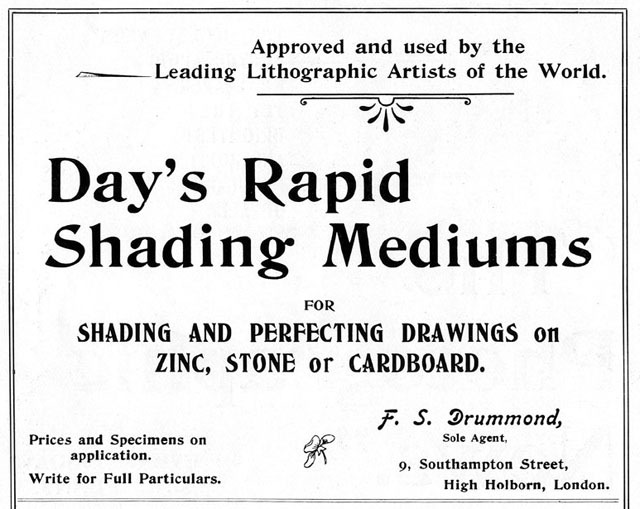 In my next post I will show evidence that by 1885 it was in almost universal use by colour lithographers. Day clearly anticipated this, at least to some extent. It seems he was not so sure whether photoengravers would take up his method, though he probably had inklings. This is hardly surprising—whereas chromolithography was well-established, photoengraving was a very new technique. Day was certainly well-placed to take advantage of the possibilities when they opened up. Use of Ben Day shading mediums did become massively prevalent in the photoengraving of black & white line art and coloured illustrations. In my next post I will look in detail at where and how the Ben Day method fitted into both the photoengraving process itself and the printing industry in a wider sense. This included, from 1891, an explosion of colour printing in newspapers, which was only possible because of two advances—new types of printing press and the Ben Day method. The histories tend to remember the presses, and forget about the dots. I hope to make amends. Also, particularly for those who have been waiting patiently—this is of course where the comic strips come in. Finally, back to the drawing board. You will have noticed that both the old advertisements I’ve shown mentioned “cardboard.” This refers to illustration board—drawing paper mounted onto a stiff backing—which professional illustrators routinely used for their finished work. 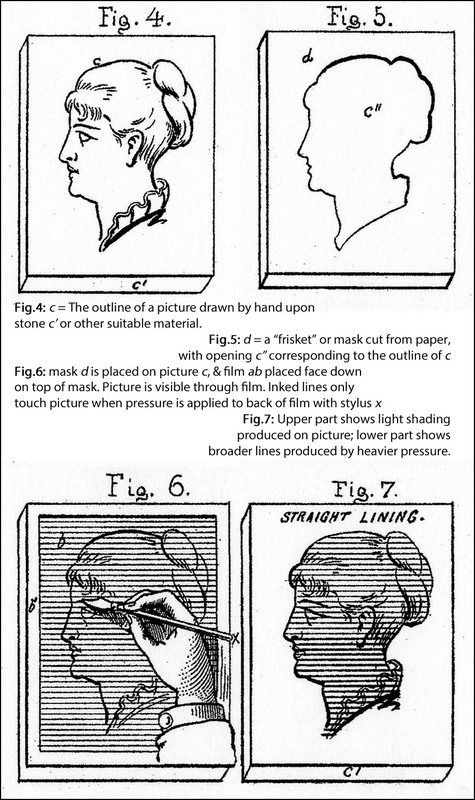 There are many references in the 1879 patent to “artistic purposes”, drawings, and artists at work. Day himself was an illustrator—did he think that his printing-films would be popular with artists, imprinting his patterns onto their drawings on board? Did he use them this way himself? If we knew that, we might also find the answer to that nagging question, why did Day repeatedly refer to wood engraving in his patent text? Is this where the emerging importance of photoengraving, Day’s detailed discussions of wood engraving and the slowness of its techniques, and his own work as an illustrator, come together? Did Ben Day—responding to the same concern as Blackburn, but over fifteen years earlier—think that artists would now want to draw pictures that looked as much like wood engravings as possible? Interesting questions. 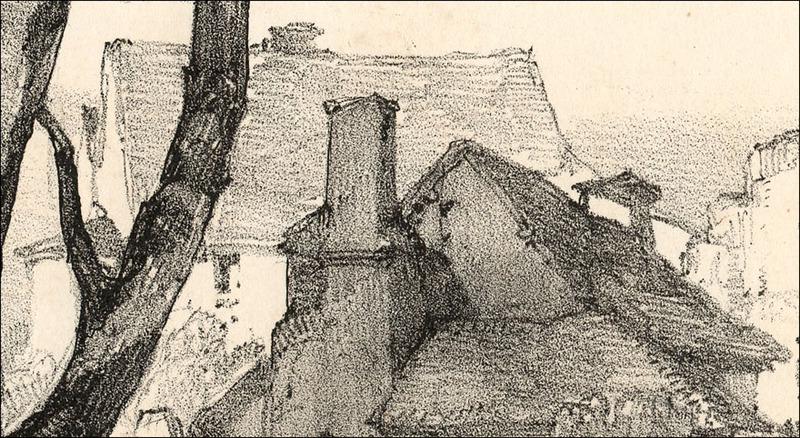 Perhaps a look at one of his own drawings from that time might help to answer them—for example, one of his illustrations from Mark Twain’s A Tramp Abroad, published in 1880. In my view this picture answers those questions without any further words from me—though in a future post I will have more to say about this important book, and Ben Day’s contributions to it. 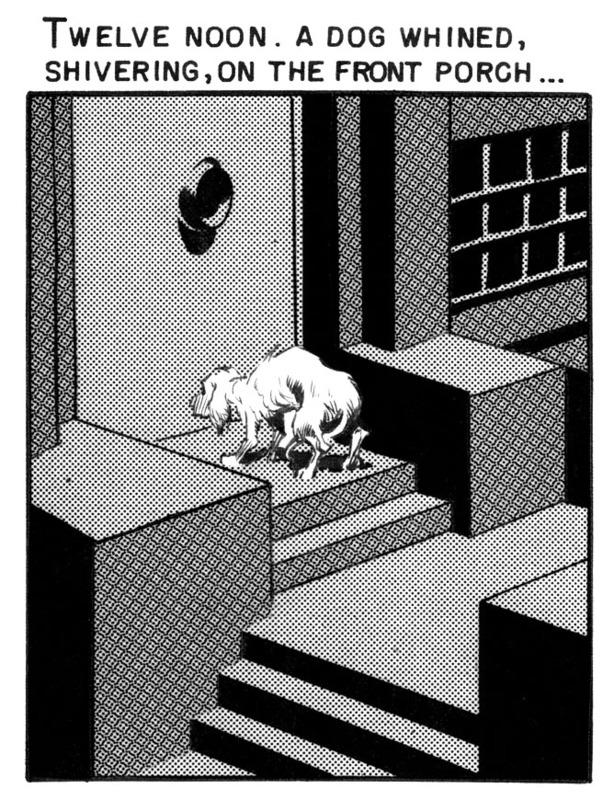 In future posts I will take a detailed look at more of Ben Day’s own black & white drawings. …in a few easy steps? How can the Ben Day dot be defined? Did comics still contain any Ben Day dots by the late 1950s / early 60s? 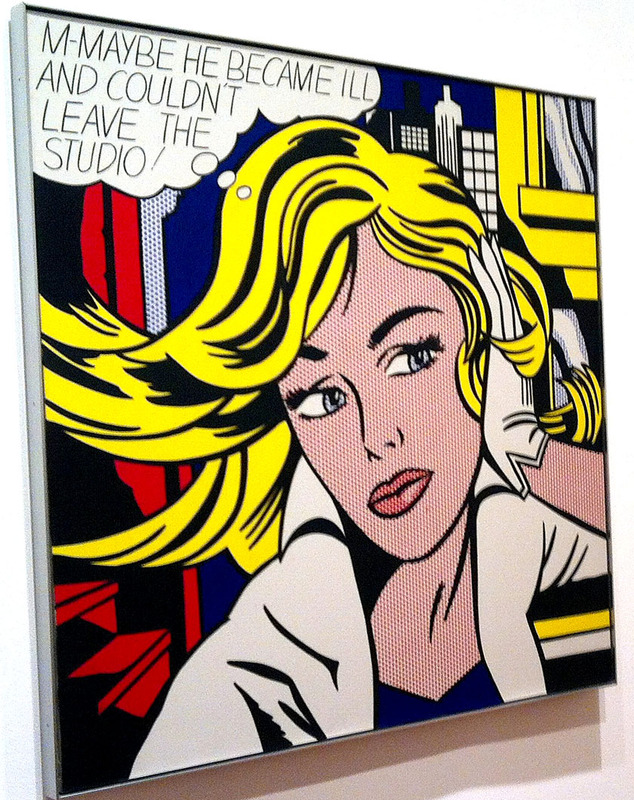 Did Roy Lichtenstein really paint Ben Day dots? Acknowledgments: Thanks to Fiona McIntosh, Amy Pryor, Andy Bleck, Roger Sabin and Shevek Freeman. Text Copyright © Guy Lawley 2015. If shared please credit me. No copyright claimed in images. (1) Advertising Production (New York, McGraw Hill, 1946) by Ben Dalgin, Director of Art and Reproduction at the New York Times. 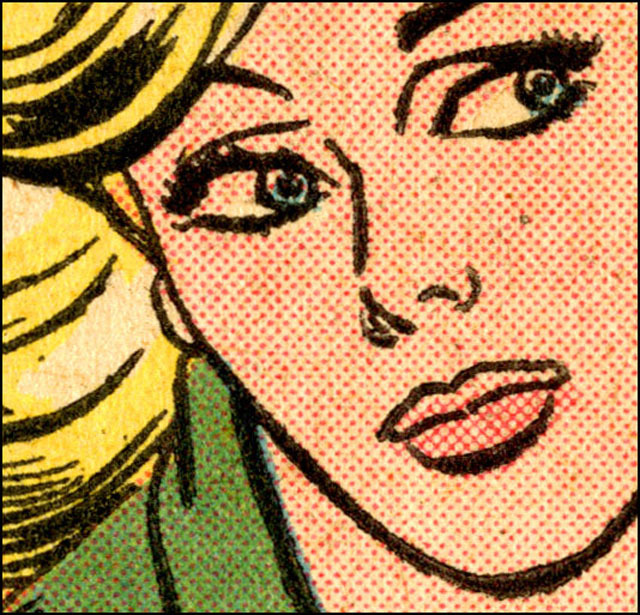 (2) From Girls’ Romances No.105 (Sparta Illinois/New York, Arleigh Publishing Corporation/DC National Comics, Dec 1964). Artwork attributed to Tony Abruzzo. (4) Possibly the sole exception was the New York paper The Daily Graphic, 1873 to 1889. This did have numerous illustrations. Ahead of its time and not a long term success, I will return to this interesting hybrid later (note 15). 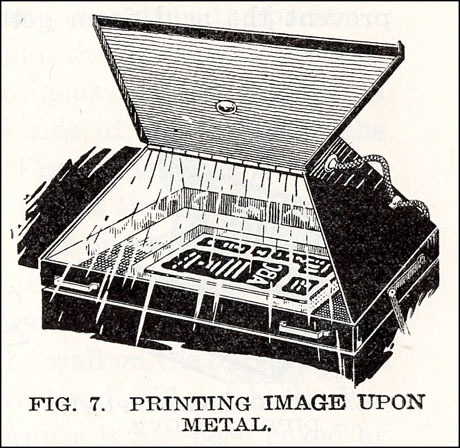 (5) The earliest efforts at photography had included making images on metal (Niépce, 1822). The Daguerreotype had been around since 1839. Fox Talbot did crucial early work on printing from negatives onto paper, patenting his process in 1841. 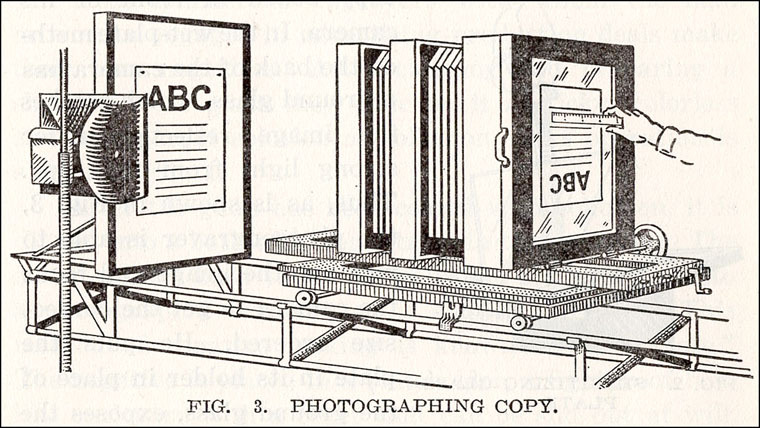 Photos in books were printed as Talbotypes, Autotypes, Woodburytypes and most successfully from 1868, Collotypes. None of these methods used a halftone screen. All the prints needed to be printed separately from the book’s letterpress text pages and added in during binding, or glued in—costly methods. (6) History of the halftone: The coming of the halftone method (described in Part 2)—allowing grey tones of wash drawings and photographs to be mass-printed for the first time—went hand-in hand with the rise of photo-engraving, if about a decade delayed, at least in terms of widespread, commercial use. Attempts had been made earlier, but from the 1860s onwards, new glass “halftone screens” succeeded in breaking up the continuous grey tones of photos or wash artwork into dots of graduated size—within the cameras which photo-engraving houses already used. 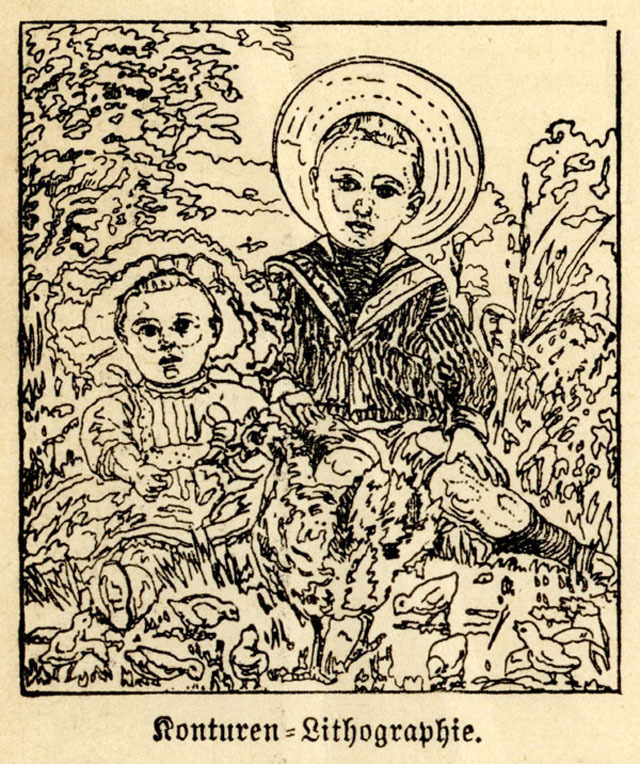 This dotted image could be developed on a letterpress printing plate by photo-engraving, and by printing the dot pattern, a reasonable illusion of the original picture with its grey tones could be reproduced. 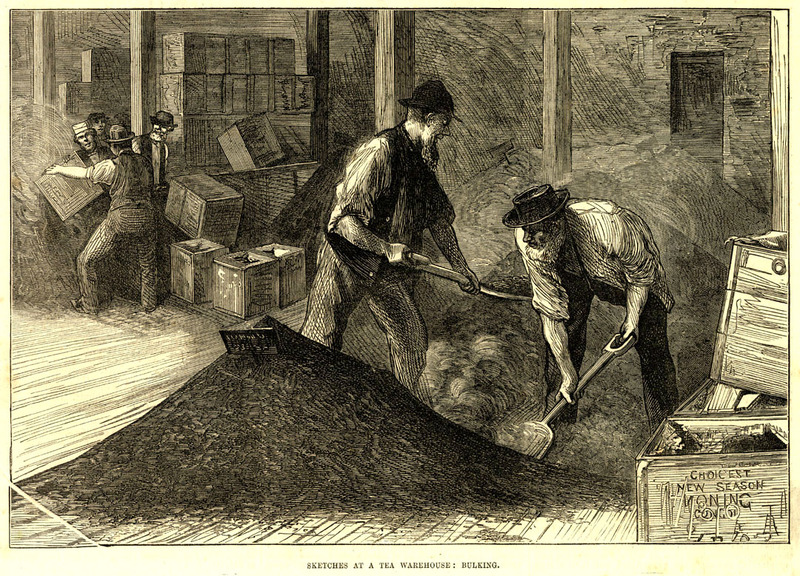 The first halftone printed from a photograph in a newspaper was in 1880: “A Scene in Shantytown” by Stephen Horgan in the New York Daily Graphic (see also note 14). This used a lithographic technique though, rather than a true relief metal plate photoengraved halftone, and the floodgates did not open straight away. Early printed halftone images were, in general, not impressive. Much hand-work had to done by engravers to achieve good results. Photo-engraving of line art had to be well established and the quality of printing presses, paper and ink all had to improve before mass printing of halftone images could really take off. 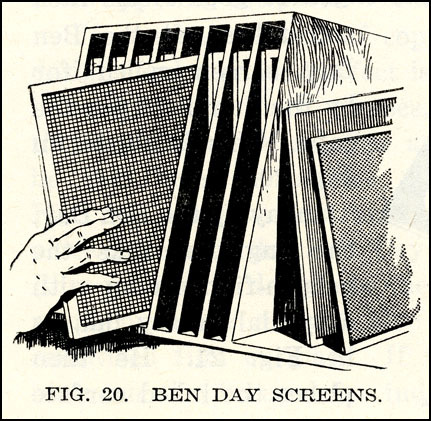 In 1887 the Levy Brothers of Philadelphia started producing half-tone screens commercially for the first time. 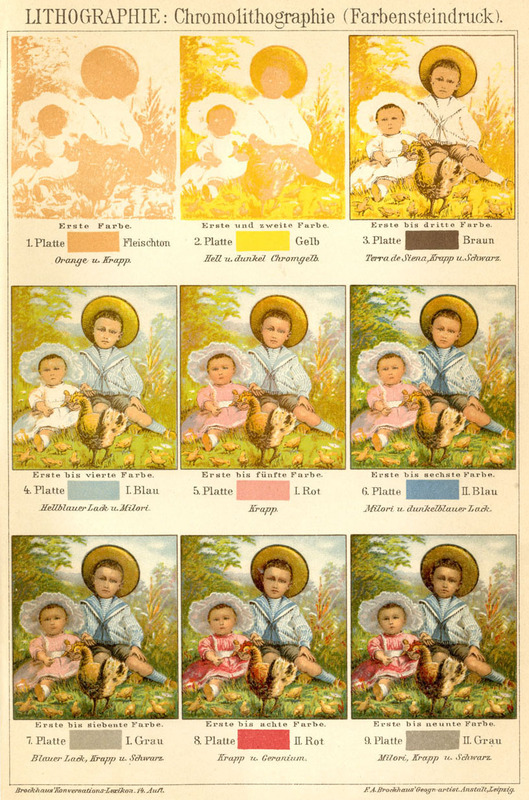 Through the 1890s halftones, especially from photographs, took an increasing share of the illustration space in magazines and newspapers. (8) See The Mass Image: A Social History of Photomechanical Reproduction in Victorian London (Basingstoke/New York, Palgrave Macmillan, 2008) by Gerry Beegan. Highly recommended and to be cited again. (10) Does anyone else look at this picture and think “Bryan Talbot’s Luther Arkwright style”—or is it just me? 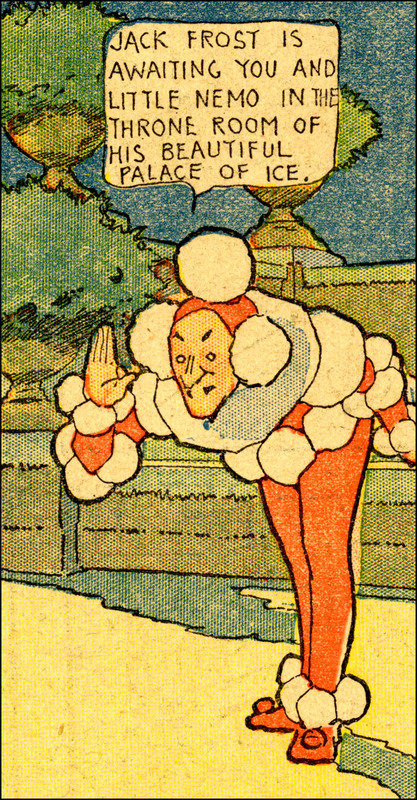 (11) Ally Sloper debuted in Judy in 1867 and is often quoted as the first comic character to appear on a regular basis, predating the Yellow Kid (from 1894 or 1896, depending on your definition). Sloper also spawned toys, live stage versions, etc., and probably directly inspired W.C. Fields & Charlie Chaplin. (13) Later versions of lithography “offset” the printed image onto rubber “blankets” before the ink finally transferred to paper. “Offset litho” is still very widely used today (2015) but it’s come a long way from the blocks of limestone that gave it its name. (14) Letterpress type was of course reverse-imaged. This is probably the origin of the expression “mind your p’s and q’s” since printers had to pay particular attention to letters which resembled each other in the mirror. Why not “b’s and d’s”? Used much more commonly, printers probably soon learned to recognise b & d without thinking. P’s & q’s might have been applied to “pints and quarts” in pub tallies as well, but I’m not sure I buy that. (15) As I mentioned in note 4, New York’s Daily Graphic was a hybrid. It had 8 pages printed from one large sheet. One side of this (4 pages) was printed by lithography, with the illustrated material, and the other side by letterpress. I don’t know if this extra expense contributed to the ultimate failure of the Graphic, though it was beset by other financial woes—see The World’s First Illustrated Newspaper, by Stephen Horgan in Penroses’s Annual, Vol 35, p.23 (London; Percy Lund, Humphries & Co. Ltd, 1933). (16) Can anyone see how many colours were used in printing this card? I tried to count them, but my brain started to melt. (18) Flader & Mertle also had this to say about photoengraving: “[It] may be rated as one of the greatest inventions of all times. It superseded handcraft methods in the making of printing plates and substituted photographic and mechanical speed, accuracy and fidelity for the uncertain effects of human hands.” As big-wigs in the business of U.S. photoengraving, they were of course somewhat biased—though they had a point. Beegan (8) discusses the ambiguous implications of that supposed “accuracy and fidelity,” specially with respect to the halftone photograph in print. (19) See also, for example, the opening sentence from Zincography: A Practical Guide to the Art as Practised in Connexion with Letterpress Printing (4th edition, London, E. Menken, 1890s—the 5th edition was 1896, the 4th is undated) by Josef Böck: Before entering upon the subject of the requirements suitable for a zincographic atelier, it may be pointed out that the workshop itself should possess the means of being well ventilated, since, during the etching process, acid vapours are developed which are highly detrimental to health… Böck might have mentioned that ether and benzene fumes were not exactly pleasant either. (23) The Art of Illustration (London, W.H. Allen & Co Ltd., 1894) by Henry Blackburn. In fact this “sudden” change was well under way long before 1894, as we see later when looking at certain illustrations published in 1880. (25) I don’t know if his publisher paid for these. I do know that Twain was very angry about Canadian publishers in particular bootlegging his books. (26) Patent documents were found using Google Patent Search. I also went to the web site of the U.S. Patents and Trademark Office, http://www.uspto.gov/. (27) If you work in centigrade… the boiling point of water, 100 degrees C, is 212 degrees Fahrenheit. The freezing point, 0 degrees C, is minus 32 degrees F. One starts to see why centigrade. This entry was posted in Ben Day, Comic-book art, Comics, History of Printing, Illustration, lithograph, lithography, Newspaper comic strips, Pop Art, Roy Lichtenstein and tagged A Tramp Abroad, Albrecht Dürer, Alice in Wonderland, Ally Sloper's Half Holiday, Ben Day, Ben Day dots, Benday, Benday Dots, Benjamin Henry Day Junior, bichromate, Bryan Talbot, chapbooks, Charles Gillot, chromolithography, chromoxylography, CMYK, collodion, Comic Cuts, Copper engraving, Craftint, Daguerreotype, Dalziel Brothers, Dragon’s Blood, electrotype, electrotyping, F.A. Brockhaus´ Konversations-Lexikon, Fortunatus, Frank Leslie's Illustrated Newspaper, Girls' Romances, Gustave Dore, Harper's Weekly, Henry Blackburn, Howard the Duck, intaglio, Jack the Giant Killer, Johannes Gutenberg, John Ruskin, Judy, Kaolotype, Le Charivari, Letratone, letterpress, line art, lithograph, lithography, Luther Arkwright, manga, Mark Twain, Marvel Comics, Niépce, Phil Normand, photo-engraving, planographic, print technology, printing technique, process, Punch, Robert Walpole, Roy Lichtenstein, Sir John Tenniel, stippling, Tarzan and the Ben Day Men, technology of printing, The Art of Illustration, The Illustrated London News, The Penrose Annual, The Process Year Book, The Process-Pictogram, The Sketch, Thor, Vanity Fair, wood engraving, Woodcuts, Zip-a-Tone. Bookmark the permalink. It was very rewarding to read your excellent report. My father started as a lithographer and ended-up as an offset specialist, excelling in art books and painting reproductions as a chromist. He had the gift of memorizing colors and their hues. Thanks for making me to understand technically what his work was. There were no graphic schools or courses in Portugal, where he lived all his life and was professionally active well in his eighties, becoming the oldest graphic specialist in activity. He was praised by Kodak, Agfa, Gevaert and Ilford technicians, being the first Portuguese to print with gold and also on silk. His name was Americo O. Esteves dos Santos. I thought people might be interested in this as history. It is good to know that it also has this personal, family dimension for you. 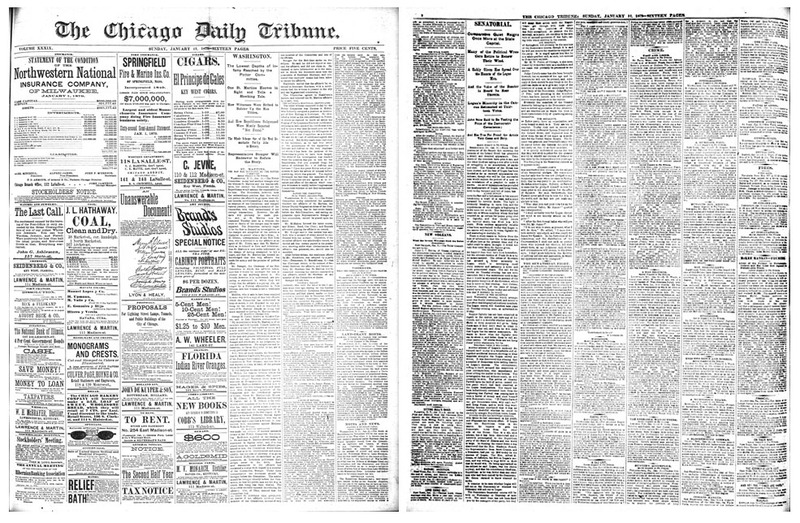 Regarding the Daily Graphic… all of the illustrated weeklies, and there were certainly a fair number of them by that time when you include the story papers, used the same method (when you unfold the sheet, you can see that one side of it has all the illustrations, and the other side is all text). It must have been somewhat more expensive and time consuming, but it was certainly a well-established method. George-Édouard-Amable Desbarats is an interesting figure. As you might know, he was a pioneer of photoengraving and published the first photo in a newspaper anywhere in the world in Canadian Illustrated News in 1869, and the first photo published in a newspaper in the US in the Daily Graphic in 1880 (that sounds a little late, seems like maybe I could come up with prior examples, but that’s the Library of Congress’s claim, and it does make me curious why he hadn’t done so in the Daily Graphic before that). That aside, Desbarats sounds like someone who was constantly experimenting with printing techniques, and Daily Graphic also seems to have spent a lot of money on marketing (the infamous balloon attempt across the Atlantic is the most prominent example), and I would guess those two things had something to do with the Daily Graphic’s financial issues. It’s a great paper, though. Easily my favorite non-fiction periodical of the era. Thanks for putting together a great resource here. I was recently startled to realize something very obvious. Ben Day of Ben Day Dots fame is the son of Benjamin Henry Day, co-publisher and likely the printer of the Brother Jonathan, and as such the man who published and printed the first comic book in America. Day Sr was instrumental in the development of the illustrated weekly in America, and the Brother Jonathan Extras were essentially the first, or among the first, cheap mass market paperbound books here too. An early book on the Day family lineage says “he was bred a printer”. Obviously the same goes for his son. I love the symmetry of the father publishing the first comic book in America, and the son developing the method that would help enable so many comics to be printed in color. Yes, it’s an amazing story, isn’t it? Occasionally I see confusion between the two men online. I found out about Brother Jonathan a few years ago. I planned to do a whole bio piece about the two men later; never happened. I’ve noticed that with the Graphic, the ILN etc as well. I presume it’s because the setting up of the press is simpler when either text or images is being done separately; in particular, the ‘make-ready’ steps must be a good deal different between the two practices. Having both images and text to deal with at one time would have been relatively difficult. as with wood-engraved pictures and typeset text, in those two publications. Many illustrated books set up the text and pictures together. The New York Daily Graphic, for whatever reasons, chose to print the images by photolithography and the text pages by letterpress, IIRC. In this case the necessity for the text and image sides to be separate was absolute, determined by the two different printing presses used. I’m grateful to you for pointing out that the end result was to a large extent the same! That particular point had escaped my notice. Quite likely they did. It would have been a time-saver. the fact that those guys experimented with them early on but published just a couple of examples tells me that their methods were almost certainly very time-consuming, complicated, and probably required a lot of touching up of the plates. Not ‘market-ready’ in other words. From what I’ve read, a lot of people were early pioneers but had the same kind of problems. PS: Mark, I meant to ask, what is that ‘early book on the day family lineage’ which you mention? Frank O’Brien’s 1918 (-ish) one and the recent ‘Sun and the Moon’ volume which is mainly about the Moon Hoax. Am I missing another one?